Happy New School Year! It’s going to be a great one! Science has become a big hit these last few days as we are diving into what sound is. Through many hands on experiments we have been able to see how sound is made, what volume is, and what is meant by pitch. 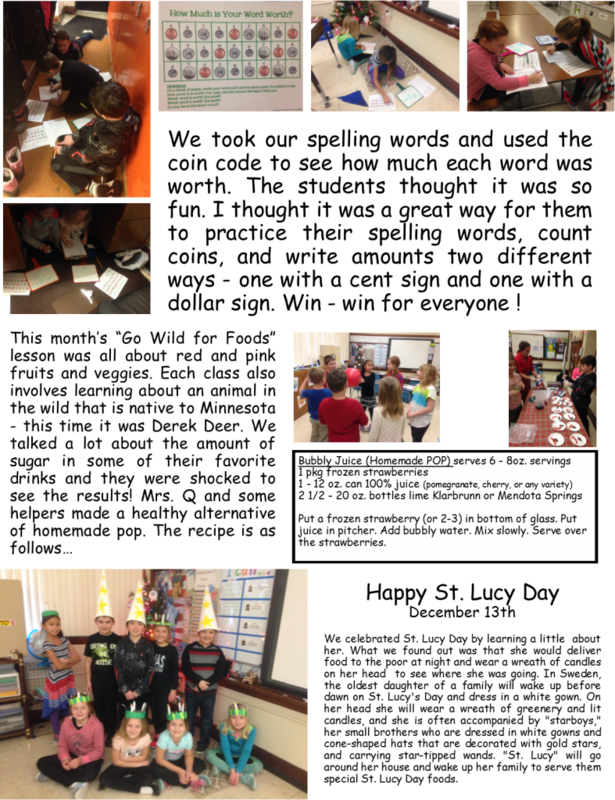 Each activity had a log sheet to fill out that included a design of their project, a hypothesis, the result, and a conclusion. 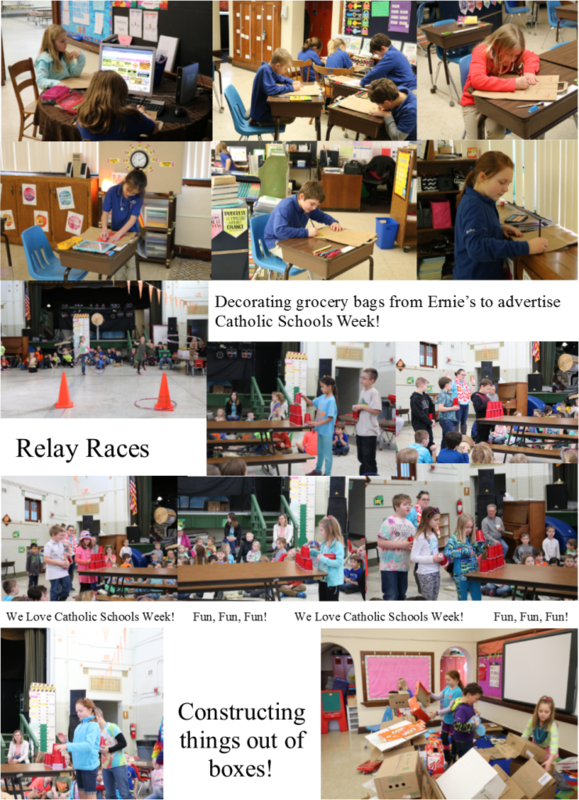 One activity the students did was to make a telephone out of paper cups and string to demonstrate how sound travels – (Who didn’t make one of these when they were young?) Another activity was to make a straw pan flute to demonstrate what affects pitch – (The longer the straw, the slower the air inside vibrates, and the slower vibration makes the lower pitch.) Their next challenge with the flute is to try to play a song with it!!!!!! We have begun to explore the world of fractions! It never fails – each year the students get so nervous just thinking about what the work will be like when dealing with fractions but I think it is only because fractions are so unfamiliar – not used as much by them like adding and subtracting has been. 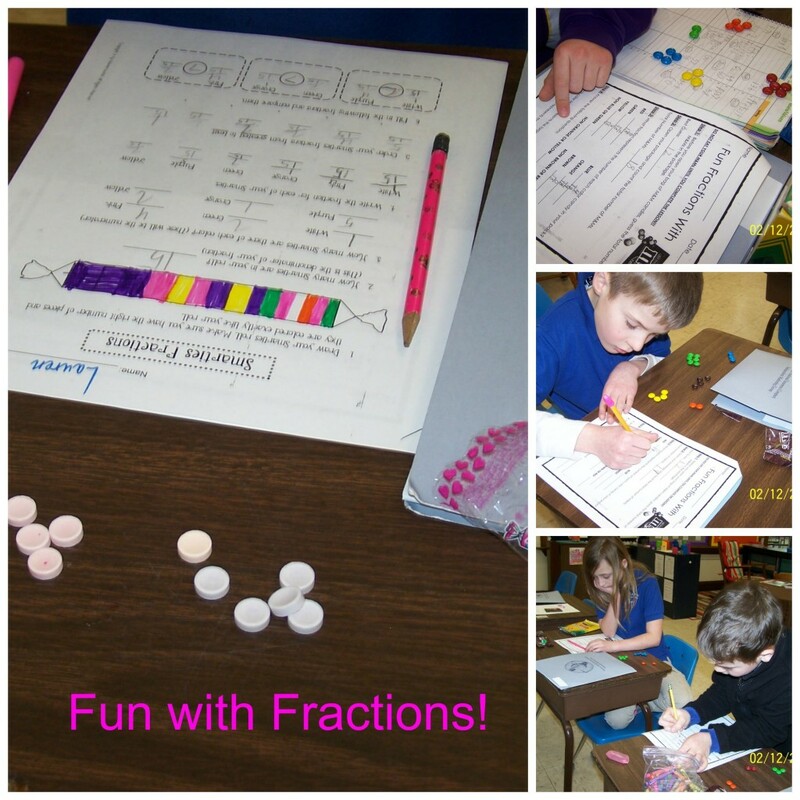 Within days they began to see that fractions can be a lot of fun and not too hard after all – especially with many manipulatives to make the job a bit easier. 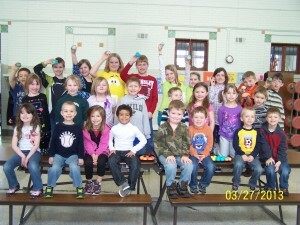 As part of “I Love to Read” month, our school took field trips to the local library today. The studnets were shown how to use the computers to look up or request books, how to narrow down a search, and other features the library had on-line to help with learning. Some students were able to get their first library card and many checked out books. We finished an amazing story in our reading called “A Symphony of Whales”. It’s about 3 whales that find themselves trapped under the ice and how an Alaskan community does everything in their power to help keep them alive until they can be saved by a Russian icebreaker. It is a lot like the movie “Big Miracle” – an excellent movie based on actual events that happened in Barrow, Alaska in 1988. With parent permission, we were able to watch it and discuss what was the same and what was different between the story and the movie. We continue to use our multiplication facts to understand division and will begin learning about fractions in the next week or so. 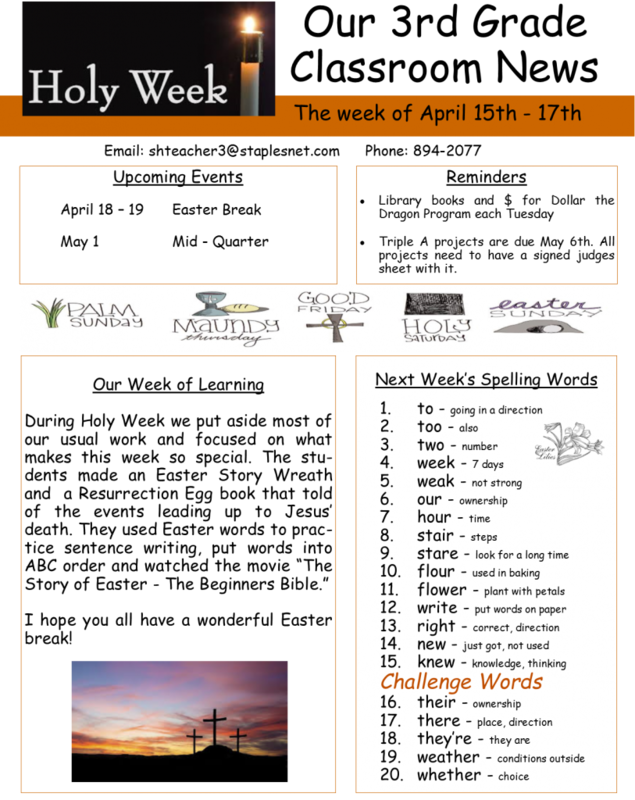 In English, we end our unit on verbs by learning about irregular verbs – verbs that, when you talk about the past, the past tense is not formed by adding the usual -ed ending – the word changes completely as in the irregular verbs go, went, and have gone. 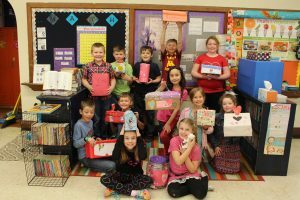 We celebrated one of our favorite holidays this week– Valentine’s Day…… We even spread some Valentine happiness and cheer by sending cards to a St. Cloud Veteran who is dying of cancer and all he wanted was mail. We pray that God watches over him and gives him peace. 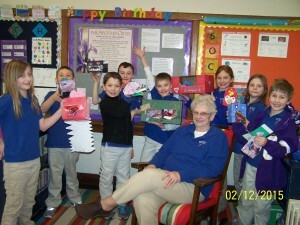 Last week was Catholic Schools Week which resulted in having a lot of fun as a school and as a class. 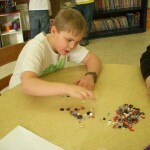 In our classroom we started a new game to review multiplication facts played like the old fashioned game of dots. We also discussed two skills that we see over and over in our reading. The first being cause and effect. This was a bit confusing at first until we realized that the cause is always the thing in the sentence that had to happen first before the other one could happen. 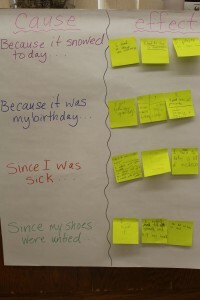 One activity was for each of the students to come up with an effect for each of the causes I had written, write it on a sticky note, and share it with the class. The other skill focused on was fact and opinion. The students were given 6 different pictures placed around the room. 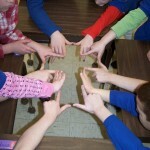 In groups of two – they were to come up with one fact about each of the picture and one opinion about each of them. We then shared as a whole group all of the facts and opinions they came up with for each picture. 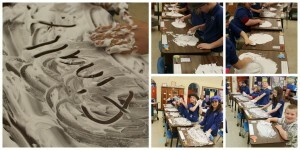 Our final “fun” learning activity was to practice writing out our spelling words in shaving cream!!!! This was exciting and made our room smell wonderful! Happy New Year! With that brings a fresh start and new beginnings. The end of this week marks the end of our second quarter and the start of the third. It is hard to believe that we are half way done with this school year. I think I say this every year but each one does seem to go by faster than the last! We continue to learn more multiplication facts and the students are amazed at how much they are remembering from week to week! They love the stories from “Times Alive”. Some were even disappointed when they found out that we are coming to the end of all of them to be told. 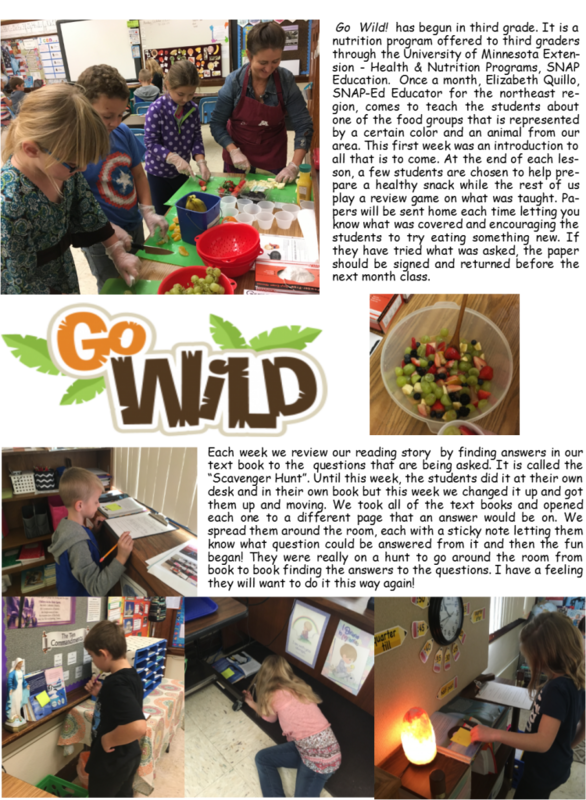 We continue to learn about healthy eating through “Go Wild”. Today focused on green fruits and veggies. 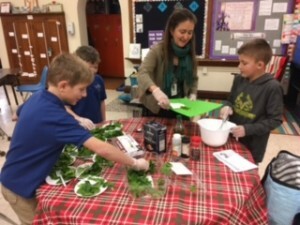 After Mrs. Quillo taught her lesson, special helpers got to help her make a dressing for a salad we shared while the rest of us played a jeopardy game to reinforce the lesson. The month of December always seems to be the month that we look forward to the most but it is also the one that goes by the fastest. As part of preparing ourselves for Jesus’ coming during Advent, the third graders made Advent wreaths and put together Advent paper chains and ornaments to hang on our little Christmas tree out on our new and improved playground. 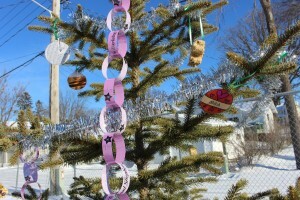 We also decided to take care of our little feathered friends by making ornamnets out of bird seed, lard and peanut butter and hung them on the tree for them to enjoy over the holidays. Forgien exchange students came over to our school and helped us celebrate Christmas around the world. 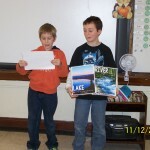 They shared with us what they do in their home land to celebrate by providing videos, food, and other visuals. 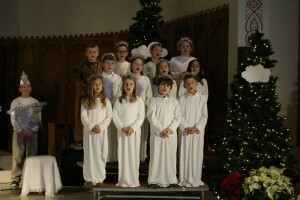 Our Christmas program was beautifully done by all of the students. The third graders got to have a small part of their own by singing, “This Little Light of Mine”, while holding on to small battery operated candles. Besides preparing for Christmas and the birth of Jesus they have also been very busy learning their multiplication facts and doing it in a fun way with “Times Alive – Times Tables – The Fun Way!”. 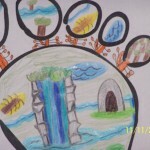 It uses stories and pictures to help students learn the facts and is especially helpful to those who are visual learners. We hope you all have a wonderful Christmas! Jesus is the reason for the season! 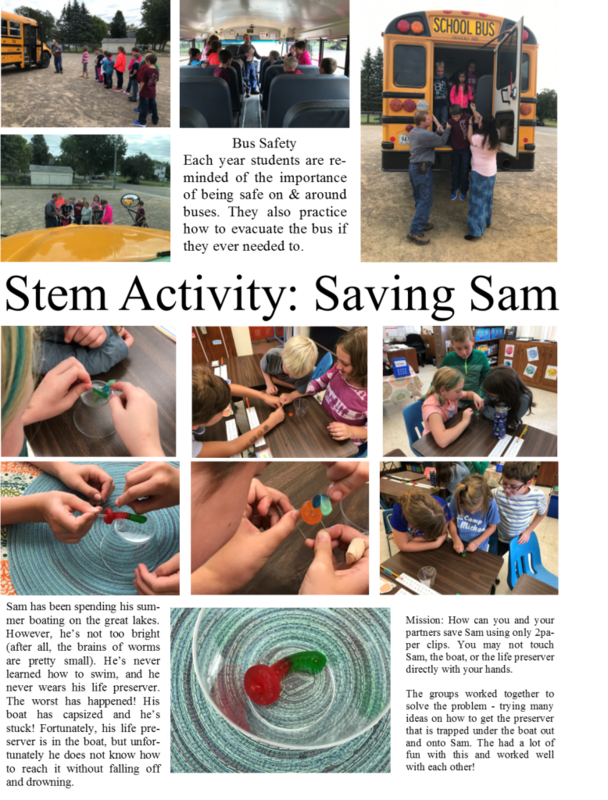 Again this year, Katie Benson, a former student of SHAS, will come to visit the Third Grade classroom to share with them what she knows about agriculture. The first lesson was on soil. 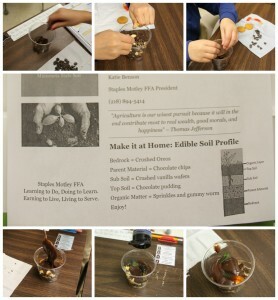 She discussed the various levels and let them do a hands on activity by creating edible soil profiles. This was a big hit as it involved food that they could eat. Thank you, Katie, for sharing your knowledge with us. 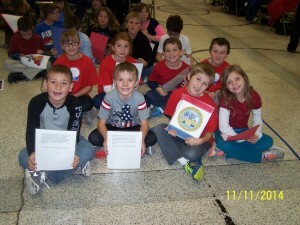 Last week we honored our veterans at a special program just for them. Each year it is our way of saying “thank you” for all that they gave up and did so that we all could live in a free country. 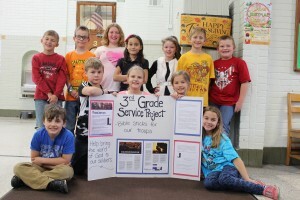 Our class service project tied in with this holiday because we asked our school families and perishioners to help us spread the word of God to our American soldiers by donating money to purchase Bible sticks – similair to MP3 players – that have the new testiment of the Bible recorded onto them. We were overwhelmed with the response we got – ($1,375 = 55 Bible sticks) – AMAZING! We can’t thank you enough for helping us! Happy Halloween! What another crazy week this was. 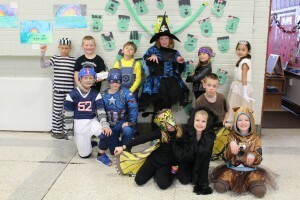 We had our Halloween party on Wednesday followed by a dance that evening. 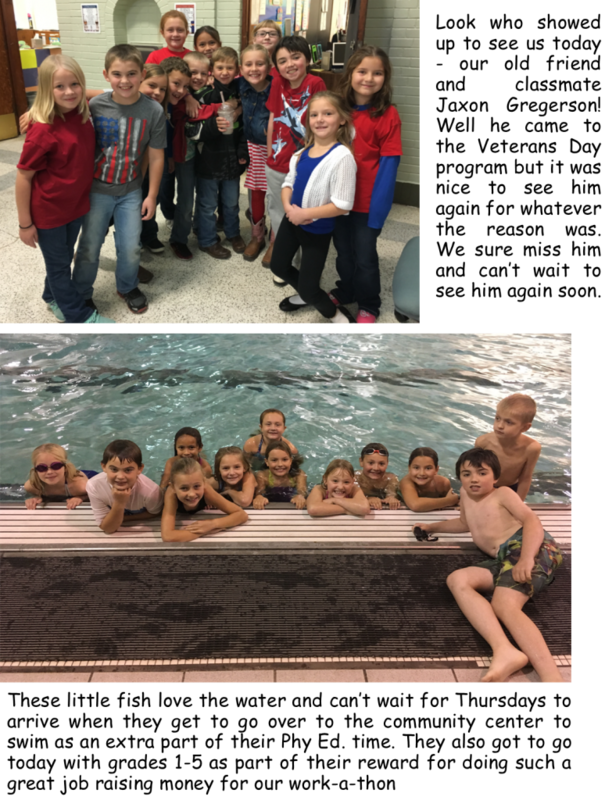 The fun continued Friday afternoon when we went to the community center to swim as part of our school wide reward for raising over $8,000 during our workathon. 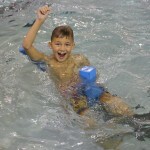 Although it was cold outside – the temperature in the pool area was a whooping 87 degrees! We did find time to get in some learning. 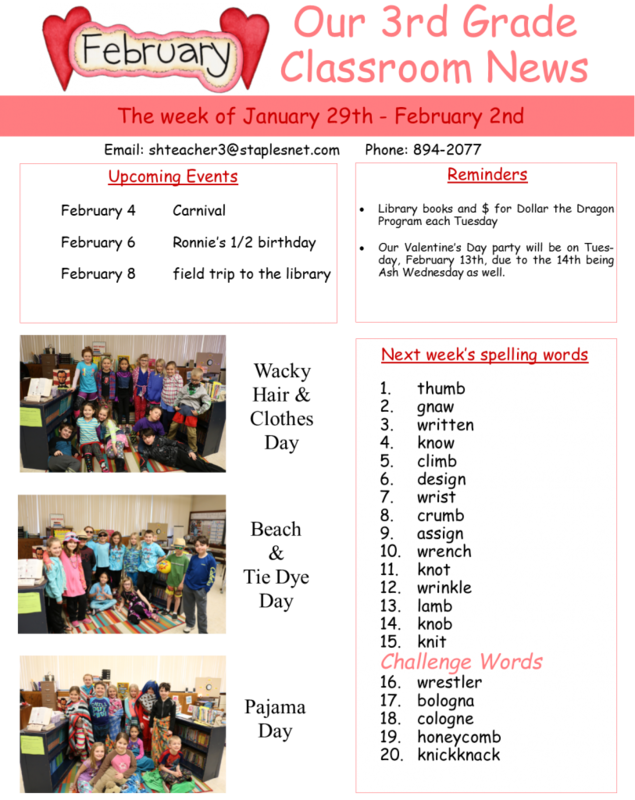 In English we found out that compound sentences are a lot like compound words…..taking two simple sentences and making them into one sentence by just adding a comma and one of the words but, or, or and to join them. In math we began unit 4 where we are adding multi-digit numbers. 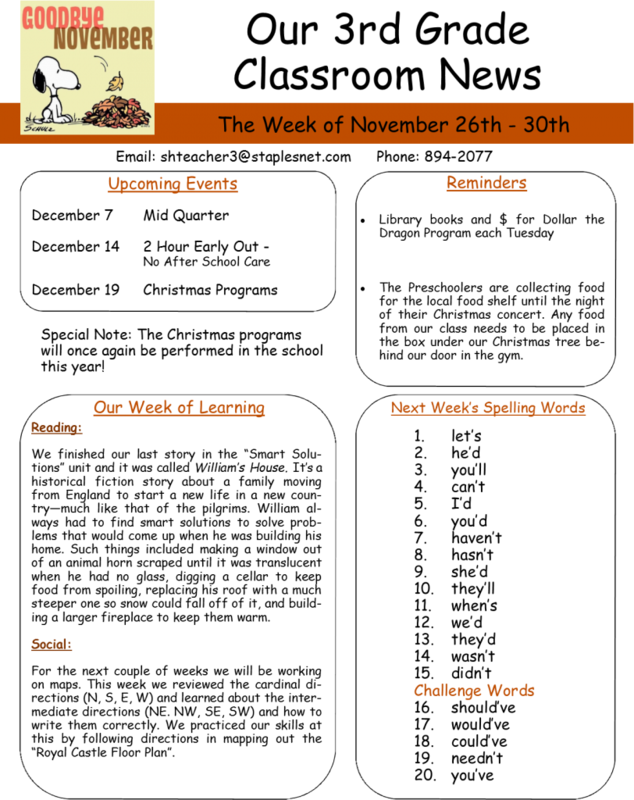 In reading we ended our first unit by reading “My Rows and Piles of Coins” and learning more about story structure, character and setting. 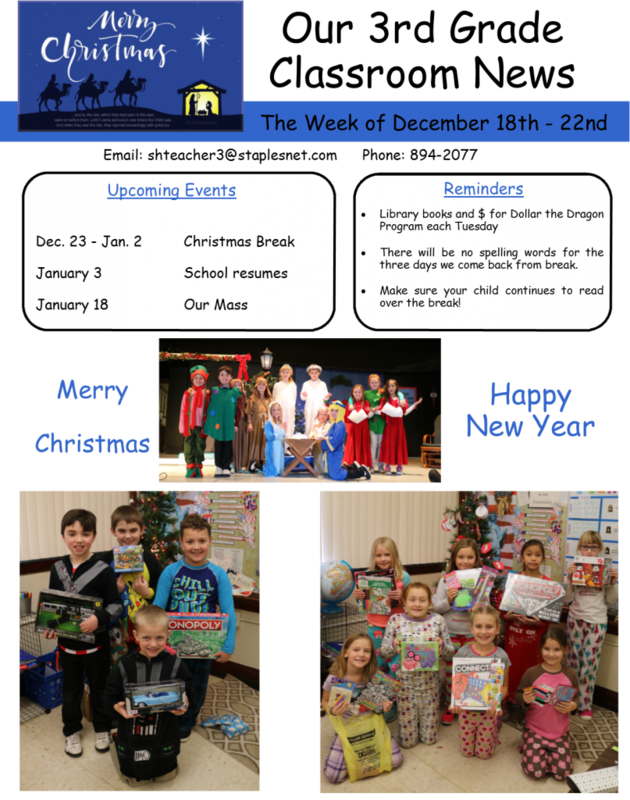 These last two weeks have been very busy ones for our school. 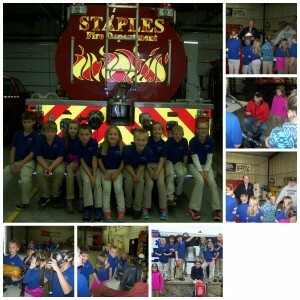 Last week we visited the Staples fire house during Fire Safety Week. Each of the students got to spray water from the big hoses the firemen and firewomen use to put fires out. This allowed them to feel just how much pressure comes out of one and why so many firefighters need to hold onto it when fighting fires. They also got to see many of the rescue tools called “Jaws of Life” that they use to help people who are trapped. All of our students were given smoke alarm detectors as a reminder to checkyour fire alarms one a month. 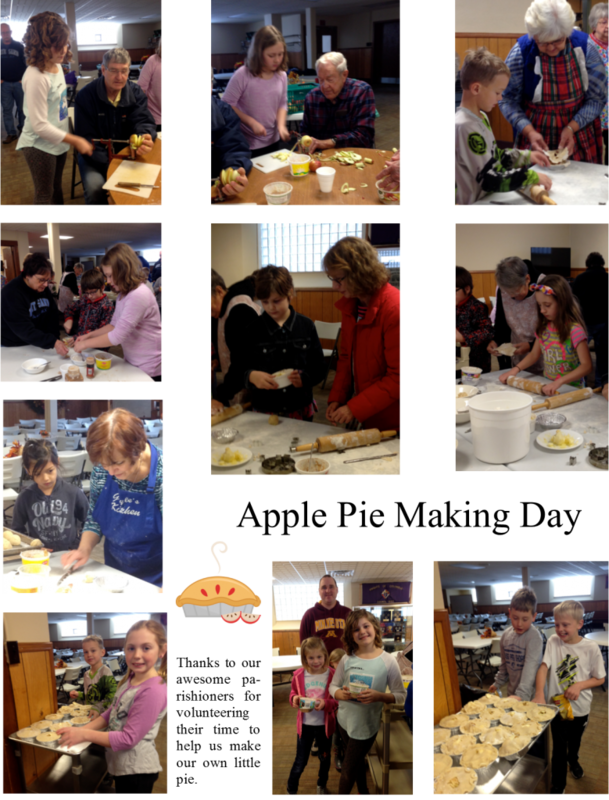 This week we did our annual apple pie making down in the church basement with the help of many church members. 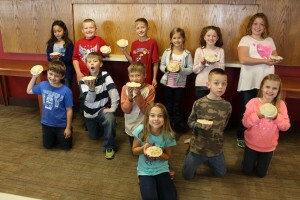 As always – the students had a blast and were excited to take their little pie home to eat! That same day our school and Home & School members hosted a lunch for all volunteers who do so much for our school. Each class did some type of decoration to show their thanks. 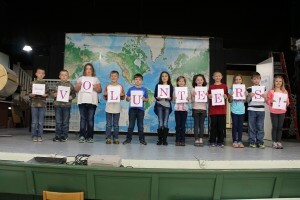 The third graders read a poem about what makes a volunteer. 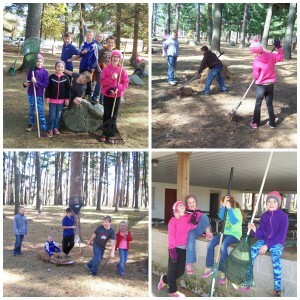 We ended this week with our work-a-thon.Our class went to Pine Grove Park and helped spruce it up by picking up sticks, raking up leaves and needles and sweeping out under the shelter. This year we had a few parents bring their turbo leaf blowers along to make the job even easier. Showing our appreciation for our volunteers! Our apple pies looking delicious! Taking a break from raking! This week was our busiest one so far this year. 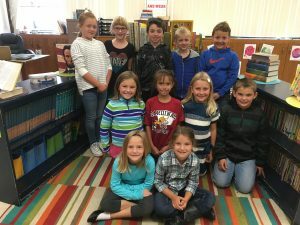 We took the last two of three NWEA tests for the fall, had Mrs. Quillo from the University of Minnesota Extension office begin her monthly “Go Wild” teaching of healthy foods and habits, worked on our second challenge in social to build a home that will withstand a windstorm, and researced information on a chosen ocean animal for our research writing projects. We even found time to enjoy a visit from the high school Homecoming Royalty and watch the parade celebrating Homecoming week. The next few weeks – basically all of October – looks to be just as busy and jam packed with fun and meaningful activities. Making a fruit salad with a variety of different colored fruits during our “Go Wild” class. The beginning stages of building our homes. This week we have been talking about complete subjects and predicates in English. It would seem to be a cut and dry concept….the complete subject is the who or what the sentence is about and the complete predicate is what they are doing. 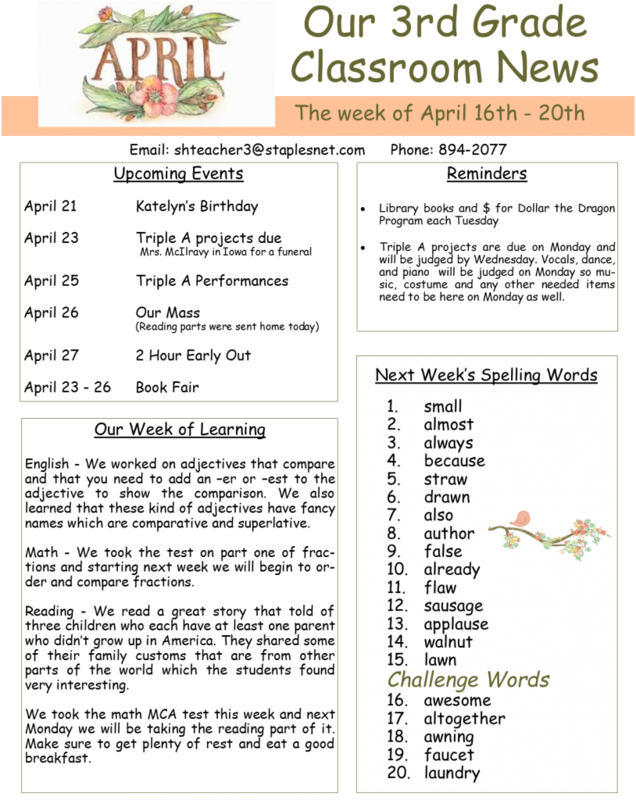 For some reason third graders struggle a bit with this as they like to group some of the actual subject words with the predicate words. Needless to say – we will continue to work on this until we get it! In math we are working on place value to the hundred thousands place – telling what place numbers are in and what their value is being in that place. We are also writing our numbers in two other ways than we are used to. We write numbers usually in standard form – 245 – but we are also writing them in expanded form – 200 + 40 + 5 – and in word form – two hundred forty-five. We have continued our practice by doing activities that, once you figure out the answer, you check yourself with a QR reader on the ipad and by creating “Place Value Monsters”. Check them out on our wall outside of the classroom. Some look very scary!!!!! 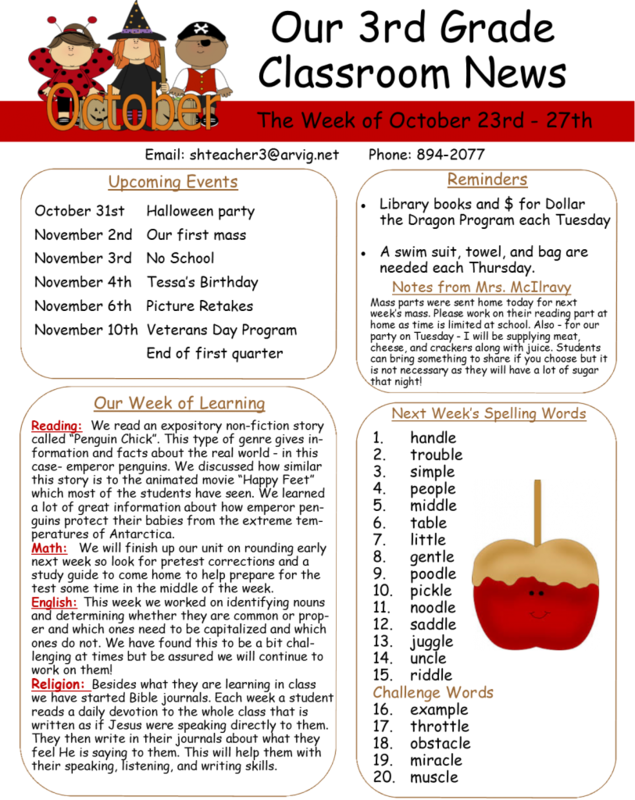 This week we read our first story called “Boom Town”. It is a story of discovering gold in California and how it brought new settlers with big dreams of striking it rich. As more and more people move in, the need for more businesses arise. In one year, a town emerges where once it was just a field. This sparked an interest in the students as to what the settlers really had to endure when building up a community out of nothing so in Social/Science we began to find out with the help of the “Great Pioneer Town STEM Challenges”. 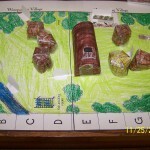 This includes 5 different challenges that help the settlers as they claim land and build a new town. The first challenge was called “Thirsty Travelers”. 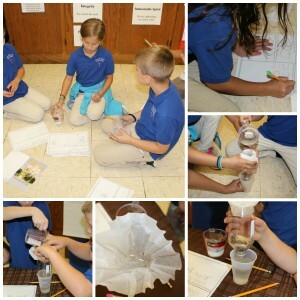 Their mission was to design and make a water filter for the settlers to use so they could use it to drink the murky river water. Different supplies were available to use – the only requirements were – the filter needed to include at least 2 different filtration materials and at least 1/2 cup of water out of 3/4 cup had to pass through. The group had to design a sketch, label materials needed, work as a group to make it, test the results, and if needed, change things up for success. They all had fun doing it and hopefully learned something in the mean time. Our next challenge will be to construct a cabin to withstand a wind storm. Welcome to another great year in Third Grade. I have 12 awesome students who are ready to learn and give their all. I can already tell it is going to be a fun filled, exciting, and educational year! It is hard to believe that a month from today we will be on our first day of summer vacation. I say this every year but this year did go by way too fast. I feel that it was only a few weeks ago that we were on Christmas break and here it is almost the end of the school year. 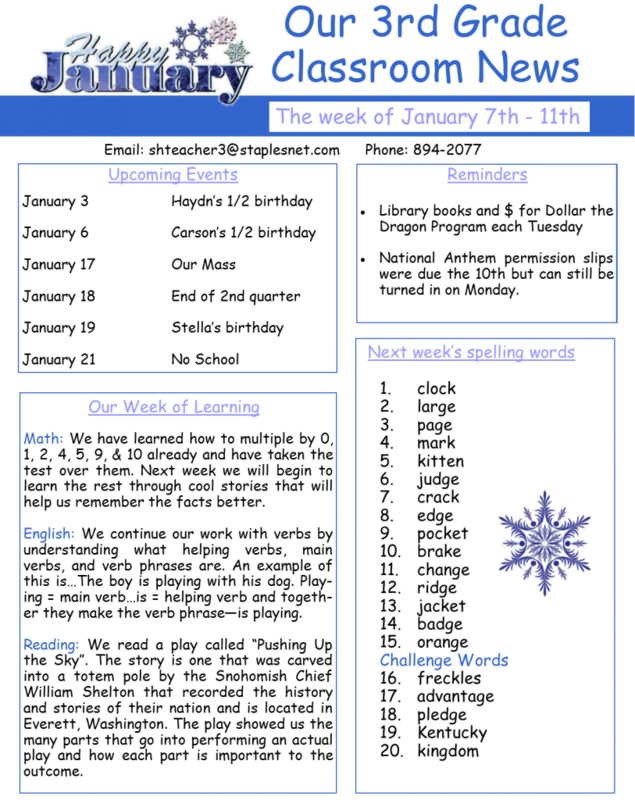 So little time yet so much still to cover….We have covered a great deal in math since ending our unit on fractions. We have learned how to measure to the nearest inch and half inch, read a thermometer, tell time and figure out elapsed time, lines, angles, and classifying plane figures and quadrilaterals. 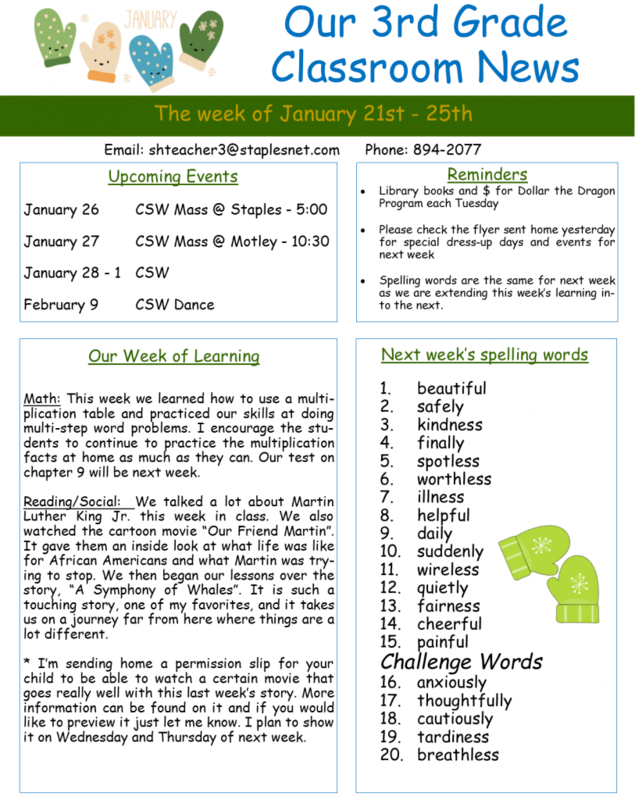 We end our reading unit that had us look at what makes people, places, and animals unique and one of a kind. The stories led us into many discussion about what makes each one of us unique, what sets us apart from the rest, and just how awesome God is to make us all so different yet so much the same. Our next unit takes a look at different cultures and what happens when two ways of life come together. It will let us share our own family traditions and experience others traditions that they bring to America from their homeland – such things as the food they eat, the language they speak, how they celebrate holidays, and the clothes they wear. 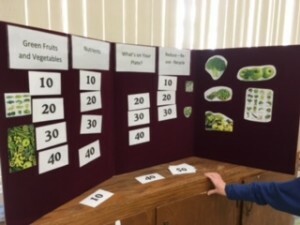 In science we have had the great fortune to have Carmen – SNAP-Ed Educator, Morrison County Health & Nutrition Programs, University of Minnesota Extension – come teach us every other week about healthy eating habits. 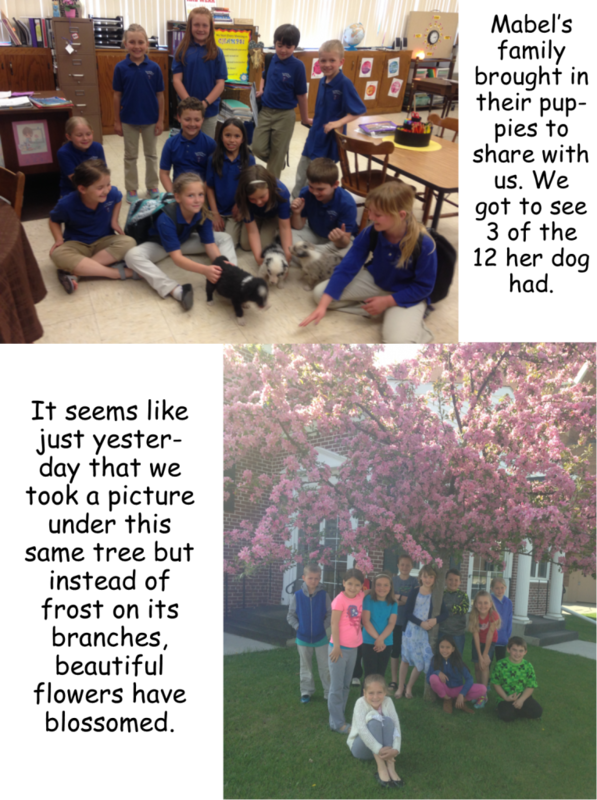 We also have a former student from SHAS – Katie Bedson – come teach us about Agriculture. We have made butter and planted vegetable seeds with her. She is also looking into letting us have eggs to hatch before the school year is over. In math we finished our unit on fractions. The third graders were so surprised that it wasn’t as hard as they had thought it would be when we first started. The things we worked on were showing different ways of representing fractions, finding parts of a group, finding fractional parts of a group, showing equivalent fractions, comparing and ordering fractions, adding and subtracting fractions, and mixed numbers. It will be easy for us to move right in to measurement next week since it relates so well to fractions. 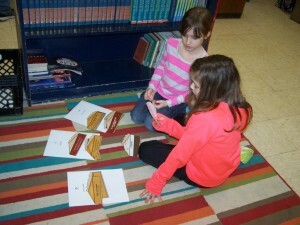 We also found some time to practice for the MCA math and reading tests that will be coming up in the next few weeks. 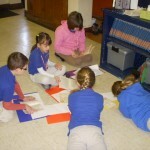 In reading we finished our book club where we read the book “The Family Under the Bridge”. As a wrap up of the book the students had to design a house on wheels for the family by drawing it out or constructing it with materials from home. They also had to design a drawing of a three room house that the Calcets would eventually live in. I am always blown away at what talent comes out of projects like these. 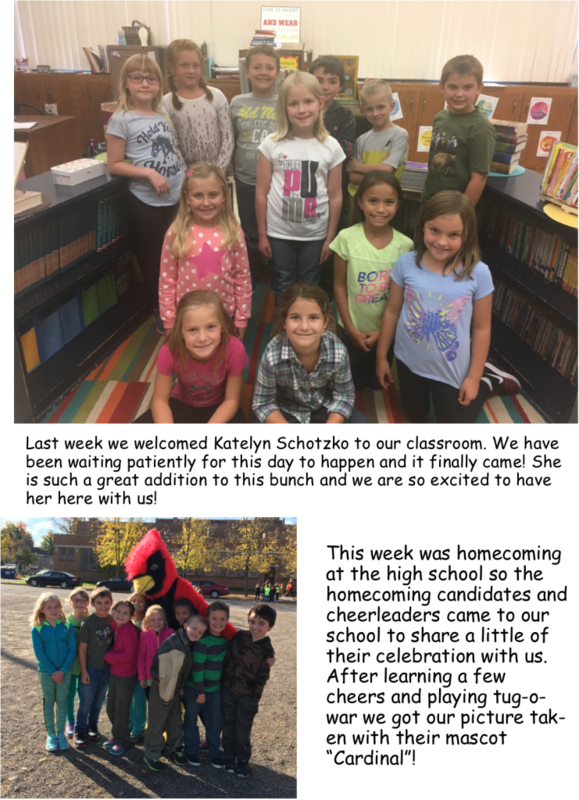 This past Monday we were able to go on our own special field trip to Central Lakes College in Staples. We were able to visit the robotics area and some lucky third graders even got to control robots that the college students had programmed. 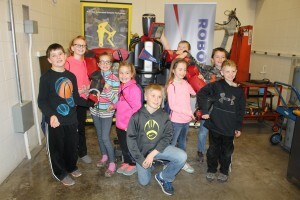 To top off the experience we got a picture taken with the famous robot Baxter and enjoyed a lunch prepared by some very special people who work there – Jill Albie and Grandma Gayle – Sophie’s mom and grandma. Thank you, Jill, for making it all happen! CLC’s very own Baxter the Robot! We finished an amazing story in our reading called “A Symphony of Whales”. It’s about 3 whales that find themselves trapped under the ice and how an Alaskan community does everything in their power to help keep them alive until they can be saved by a Russian icebreaker. 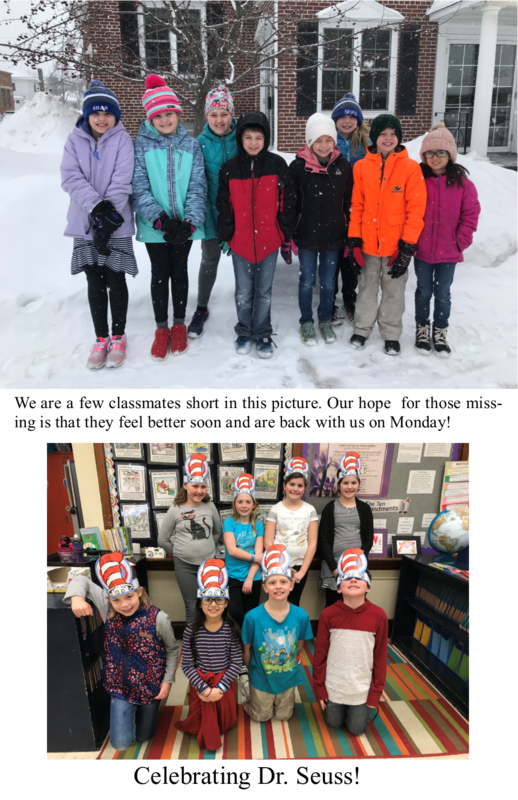 It is a lot like the movie “Big Miracle” – an excellent movie based on actual events that happened in Barrow, Alaska in 1988.In Science we have been learning about different classes of animals such as mammals, reptiles, and amphibians and what makes each class special and unique from the others. Next week we will talk about animal adaptations and what certain animals have or do to protect themselves from predators. We continue to use our multiplication facts to understand division and will begin learning about fractions in the next few days. 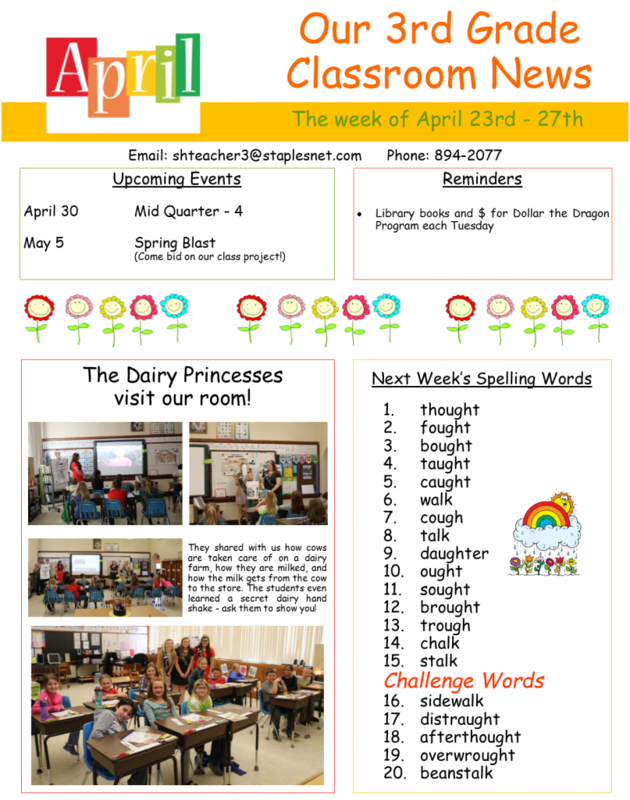 In English we end our unit on verbs by learning about irregular verbs – verbs that, when you talk about the past, the past tense is not formed by adding the usual -ed ending – the word changes completely as in the irregular verbs go, went, and have gone. Don’t forget to go to the first Lenten fish fry this Friday down in the church basement! It is hard to believe that not only is it almost the end of January but it is also the end of another quarter. This new year continues to bring a lot of fun into our classroom. In social we learned about economic resources by reading the book The Goat in the Rug. 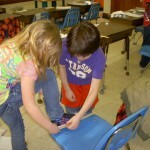 We were focusing on the economic resources that are involved in making a woven rug. Three resources involved are natural resources, human resources, and capital resources. The natural resources are those things found in nature – in this story they were the berries, nuts, goat’s hair, and water. The human resources are the people who are doing the work – in this case – the weaver. The capital resources are the tools and equipment that are used to produce something and can be used over and over without being used up – in the case tools such as shears, carding comb, spindle, large pots, and a loom. We were all amazed at just how much goes into making a single product. In reading we read a story called “Night Letters”, which brought us back to revisiting the 5 parts that make up writing a letter. In honor of Martin Luther King Jr., I felt it important to first familiarize them with words such as segregation, equality, diversity, boycott, and protest that they would hear again and again about what he was trying so hard to fight for and against. We read a story about his life and then listened to his famous speech – “I Have a Dream”. We talked about why he was giving this speech and from pictures in the book the students could tell that he gave it at the Lincoln Monument. 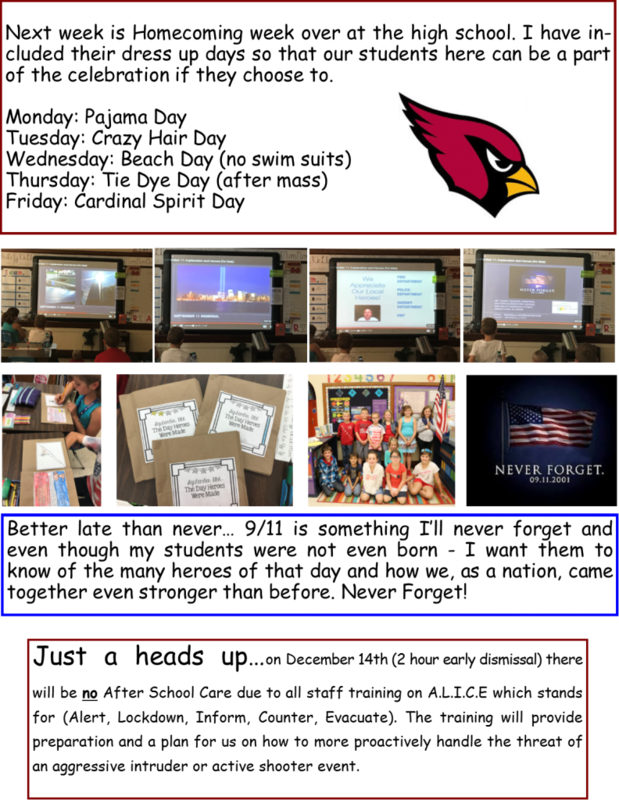 That led to taking a tour on the web to look at other monuments in and around Washington D.C. We then brainstormed our own ideas on what we would dream for the future. Each student wrote a speech much like MLK did and shared with the rest of the class. I just hope that the feelings my students have right now about treating others as equals and that skin color is just that and nothing more carries on throughout their whole lives. God created all of us and He makes no mistakes! Happy New Year! Before the break we celebrated with a wonderful school wide Christmas program. All of the students did a great job sharing the true meaning of Christmas. 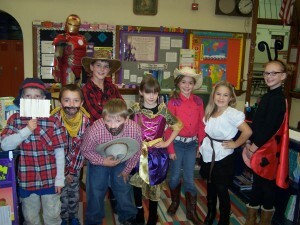 The Third Graders had fun being sheep and newspeople. We had our own party by exchanging gifts, eating good food, and taking lots of pictures! We were visited by 13 high school students who are foreign exchange students. 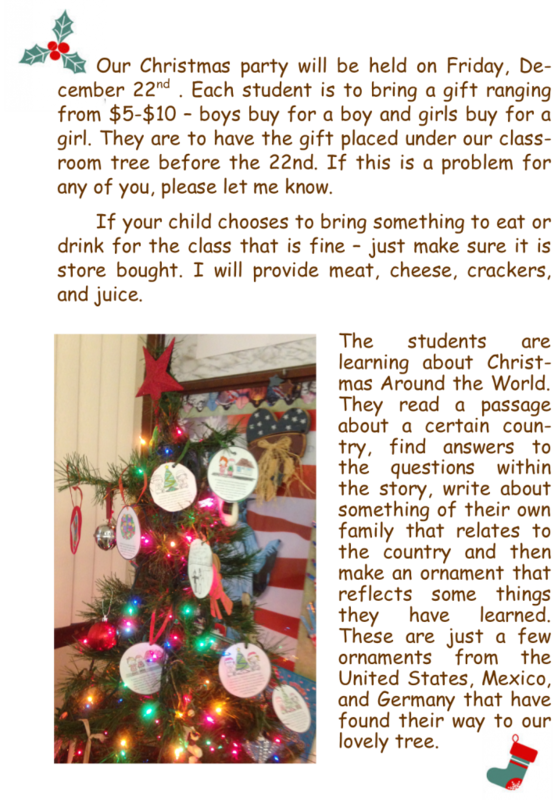 They shared with us the many different Christmas traditions their individual countries do. 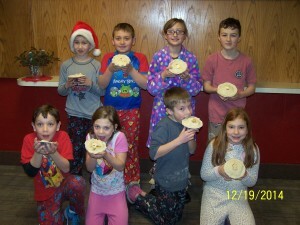 We also got to make apple pies in the church basement with some parishioners from the church. This has become a tradition for us and one that we look forward to each year – it always produces yummy results! We hope the holidays were filled with fun, family, good health, and God and we wish all of you the best in 2016! Happy Advent everyone! 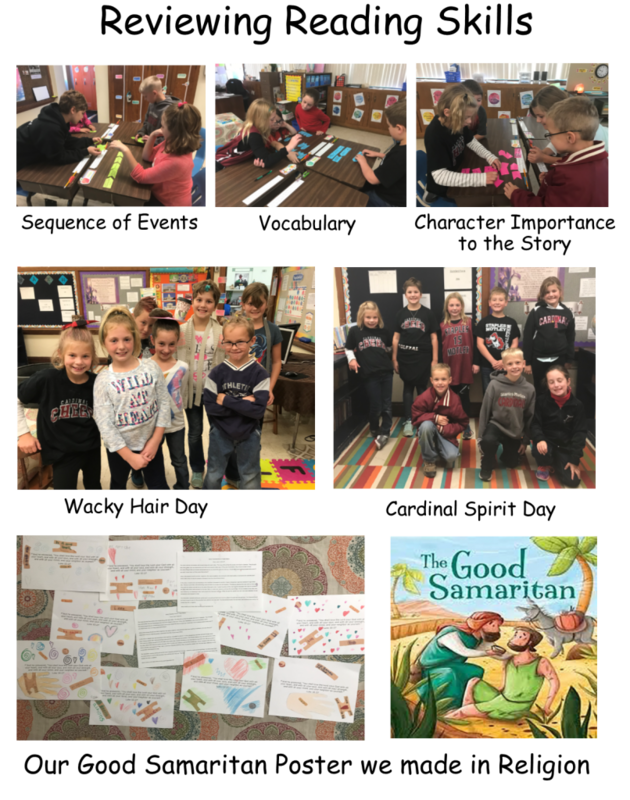 The Third Graders have been sharing what Advent means to the rest of the school each week through the “Seeking Our Savior Advent Detective Journey.” Every Monday they have read verses from the Bible and shared important information or “evidence” about the people, places, and events that led up to Jesus’ birth. 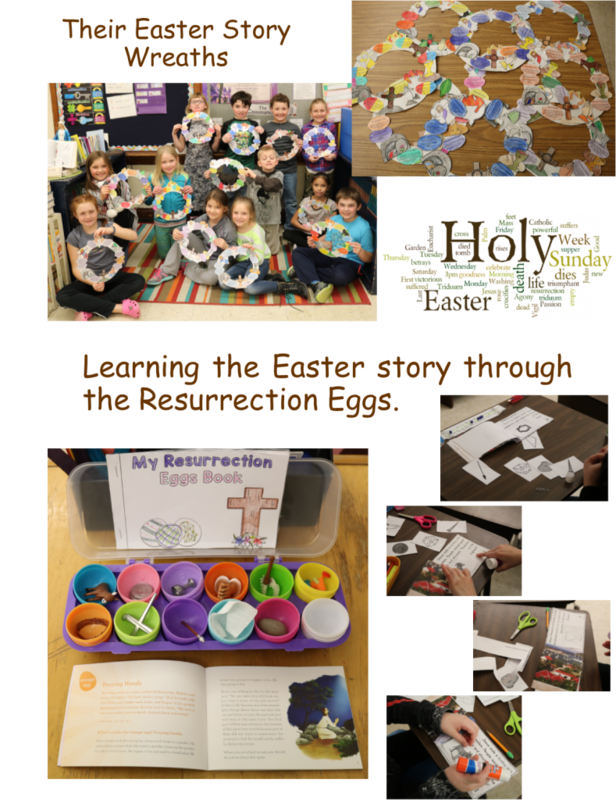 After each piece of evidence is revealed all students are able to make or have something that symbolizes the clues to help them always remember what Advent is really about. Besides preparing for Christmas and the birth of Jesus they have also been very busy learning their multiplication facts and doing it in a fun way with “Times Alive – Times Tables – The Fun Way!”. It uses stories and pictures to help students learn the facts and is especially helpful to those who are visual learners. The last story we read in reading was called “The Gardener” which was written in the form of friendly letters. We decided it would be fun to review the 5 parts of a letter and write our own letters to Santa Claus. 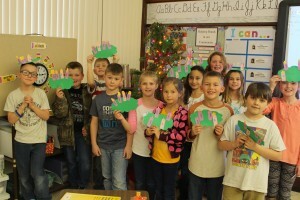 Finally, we read many picture books about “The First Christmas” and discussed what the true meaning of the season is…. it’s not about the presents or the decorations…..Jesus is the Reason for the Season! We hope you all had a chance to see our Christmas plays last night – they were awesome! Merry Christmas to you all and we hope 2016 brings you many blessings! 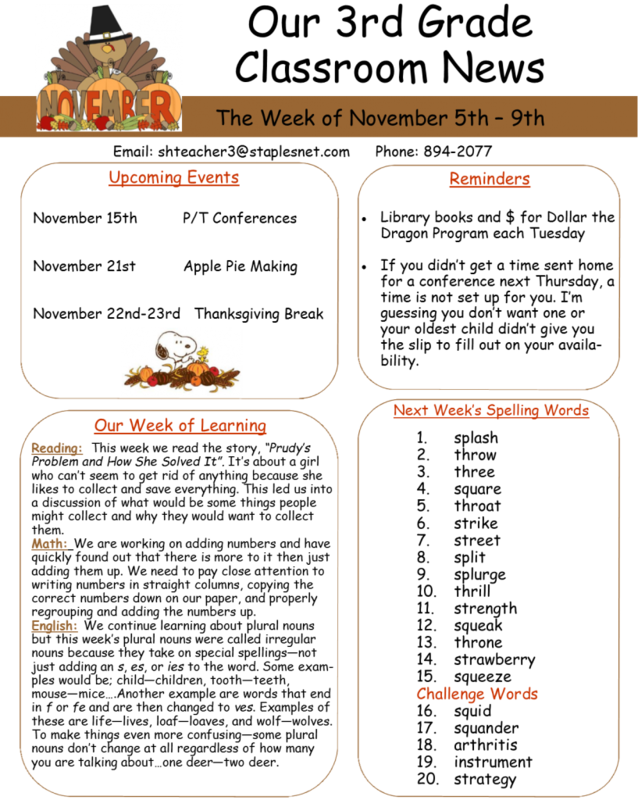 Last week we spent a lot of our time learning all we could about the first Thanksgiving. 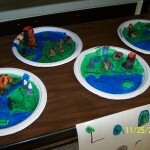 The students made models that helped them learn more about the Pilgrims, their voyage to the “New World”, their settlement in Plymouth, and what the Mayflower may have looked like. They were surprised that for such a large ship, only a small portion was used for the Pilgrims to stay in as it wasn’t built to carry passengers. The models also helped them compare the Pilgrims’ way of life to that of the Wampanoag, the Native Americans they encountered upon their arrival to their new home. 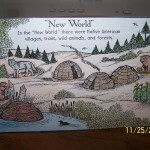 We also spent some time with the Scholastic interactive lessons on the First Thanksgiving. 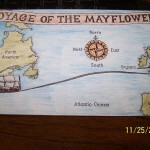 These lessons focused on “The Mayflower”, “Daily Life for the Pilgrims and Wampanoag”, and “The Feast”. There was also time for students to divide into 2 groups and read through 2 different plays that they worked on and made props for to share with the other half of the class. 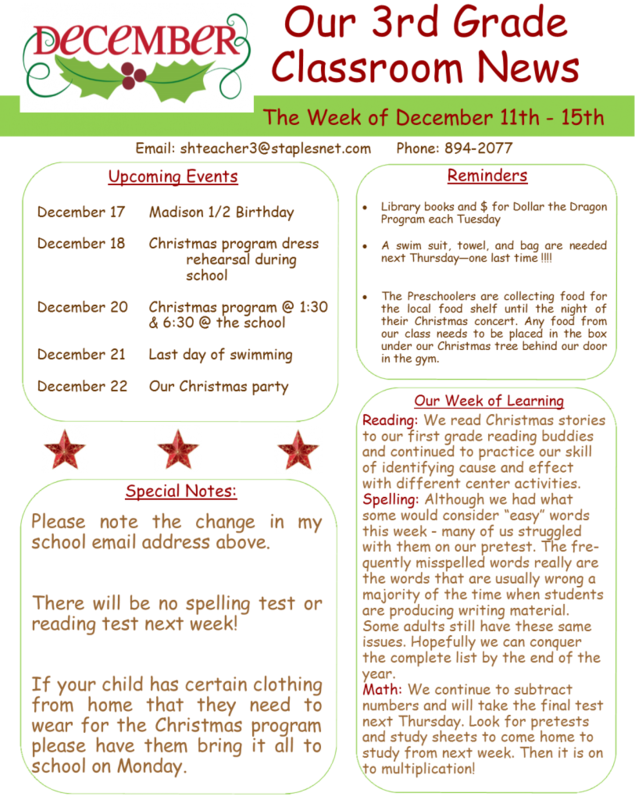 And just like that – it is time to turn our attention to Advent and preparing for the Christmas program. 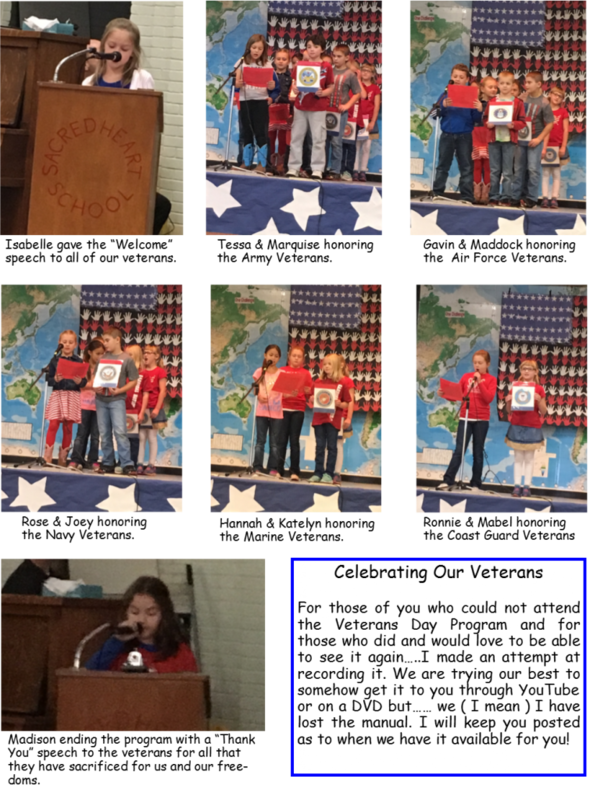 Last week we were able to honor our veterans at a special program just for them. It is always our way of saying “thank you” for all that they gave up and did so that we all could live in a free country. Our speaker made a great point in reminding us that the men and women who go off to serve our country aren’t the only ones we should be honoring and thanking. We should also give thanks to those left behind that are picking up the pieces back here at home. They also need to be recognized for their dedication and sacrifices. So to all of you – we thank you! 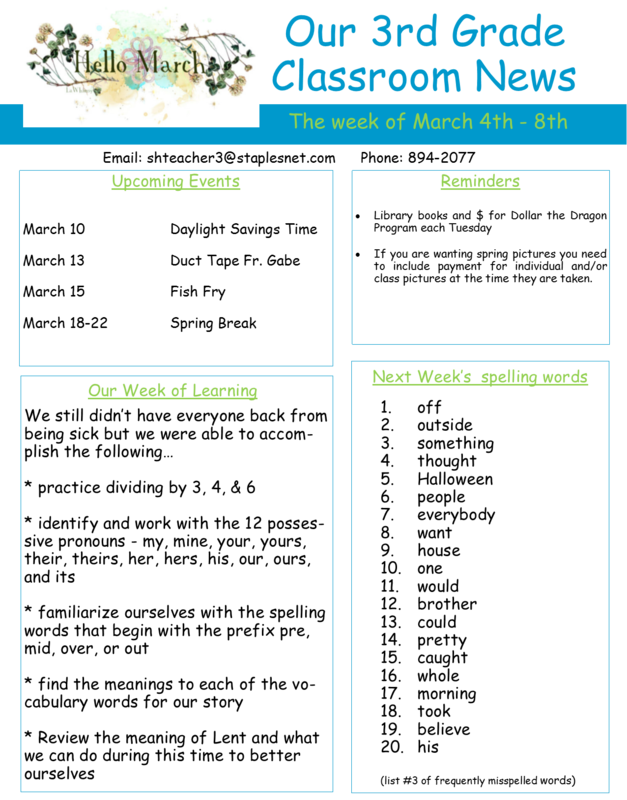 In English we have been learning about singular possessive nouns which seemed complicating to them at first but when we broke it down word for word and found out that it meant one person, place, or thing owning something it became less confusing for them. We practiced writing sentences about animals owning things such as; The pig’s tail is curly. The wolf’s cub is very small. At times we wanted to use the noun and make it plural instead of possessive ( The forests have many trees.) but we will continue to work on this next week when we learn about plural possessive nouns. We are now into chapter 5 of our math book which brings us to the dreaded lessons of subtracting numbers. 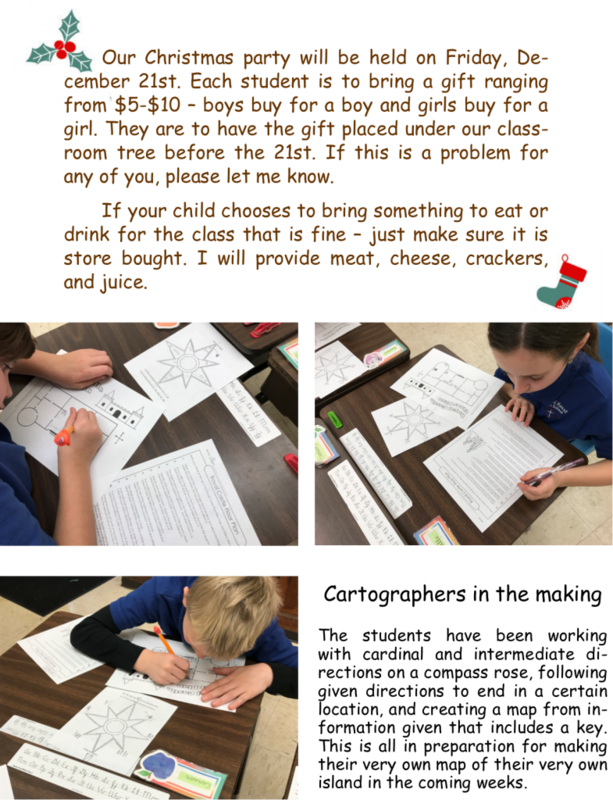 The students were not looking forward to this challenging task especially with numbers that involve regrouping or as it was called back in my day – borrowing. Through math antics videos and sample questions we were able to practice, step by step, the process that needs to be followed in order to solve each problem correctly. 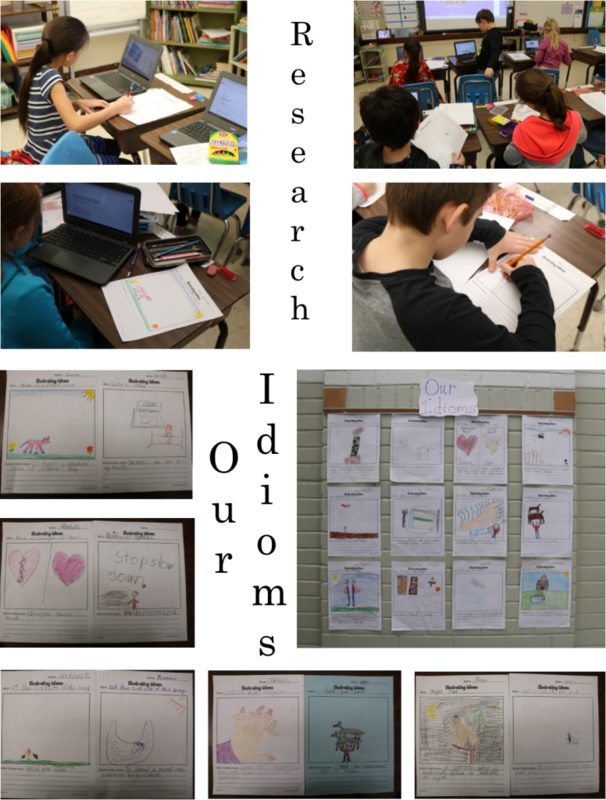 All of this helpful information was put into our interactive notebooks for daily reference and reminders. We also used base ten blocks to actually see the regrouping happening and what it really looked like – for some this was just what they needed in order for it to all make sense. It was great meeting with all of my parents last Thursday at parent/teacher conferences. Your children are doing amazing and I am truly enjoying every minute with them. Please remember that I am always available if you have questions about anything. 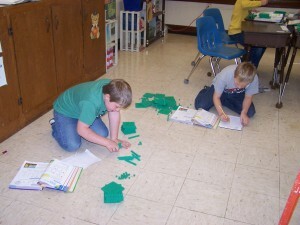 Practicing subtraction with base ten blocks. Today was an amazing day! 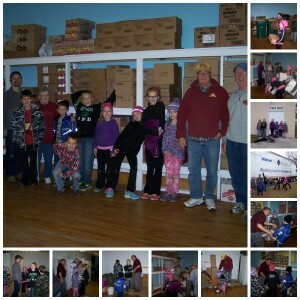 Not only was it a two hour early out – the third graders got to go on a field trip to the Staples Food Shelf. We went there to help unload the semi that comes there the first Friday of every month. We were told that an average load is 3 pallets but because of the holiday season quickly approaching this semi would have 7 to be unloaded. What a perfect time and place to lend a helping hand. 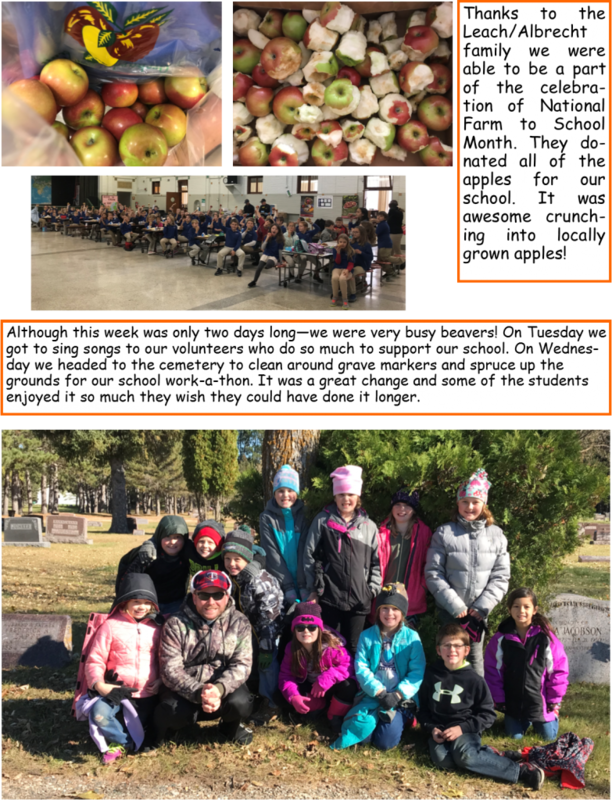 The students helped fill shelves with items such as jelly, peanut butter, soup, cereal, juice, hot dish meals, and even filled several refrigerators with different types of meat. Not only did the students have fun but I think the regulars enjoyed their company as well. 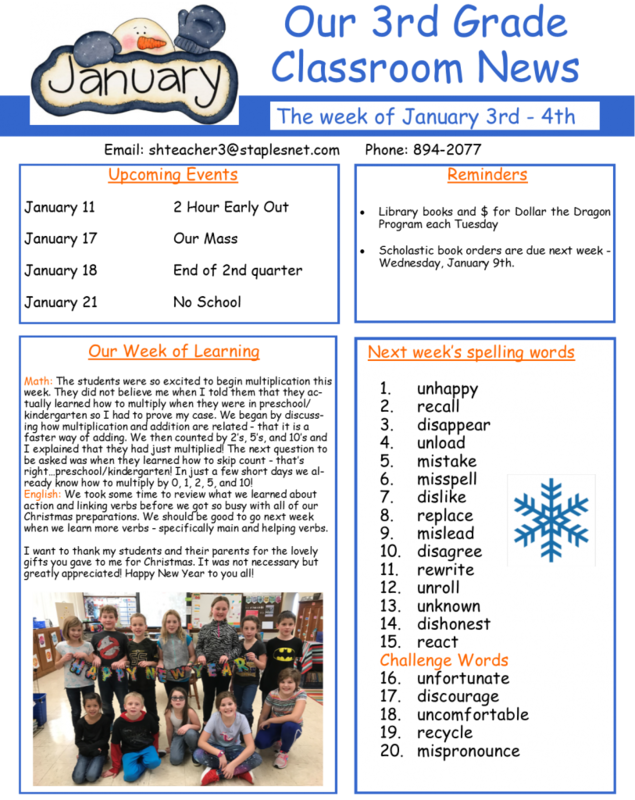 Academically, we continue to tackle regrouping in addition, learning the tricks on how to change singular nouns into plural nouns in English, reading stories about problems characters face and how they go about solving them, and in social we have been studying maps. 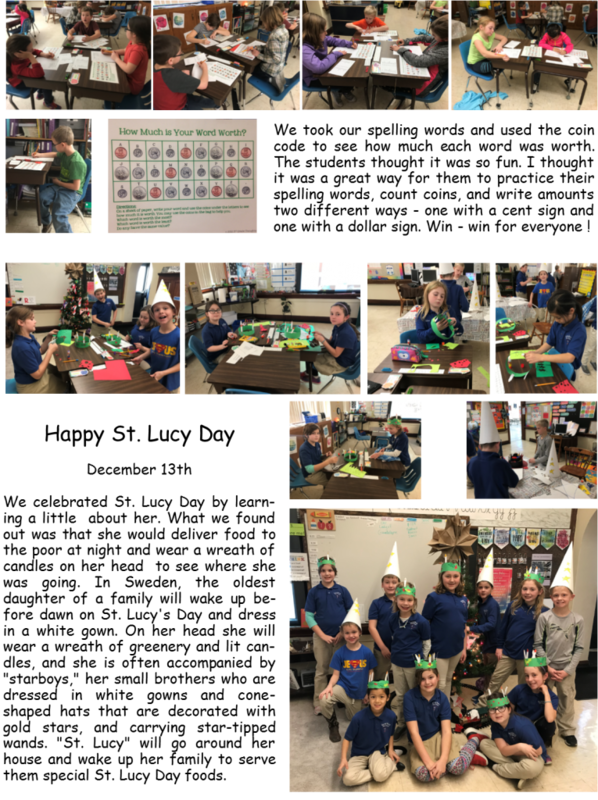 We have learned the cardinal and intermediate directions of the compass rose, practiced giving directions from one place to another, and what is needed in making a map by learning the acronym “TODAL”. This stands for the 5 basic parts that each map should include – Title of what the map is about, Orientation (compass rose), Date of when the map was made, Author – who made the map, and Legend (map key) – symbols that stand for what is on the map. 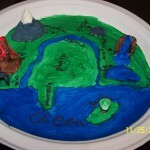 They also learned that the word “cartographer” means one who makes maps. We thought it would be fun to become cartographers and put what we learned into making our own maps. So for the last couple of days each of them have been busy making their own map called Barefoot Island including anything they thought would be important. By the looks of them I would say we may have some real future cartographers! The Third Graders have been very busy since school started. We finished a reading unit of 5 stories talking about money, how to earn it, what to do with it after you have earned it, and what happens with it when you put it into the bank. We learned what interest means and thought that it was pretty cool to get even more money out someday then what you put in because of the interest you made on your money. We spent many, many days tackling rounding numbers in math. It got a bit tricky when a thousand number needed to be rounded to the nearest ten or hundred but we made it through and will keep practicing throughout the year. 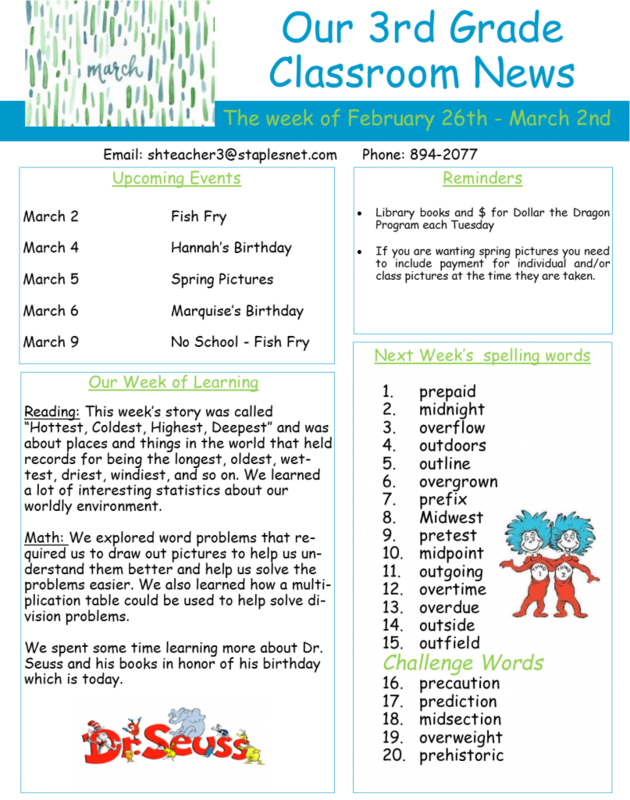 In English we found out that compound sentences are a lot like compound words….taking two simple sentences and making them into one sentence by just adding a comma and one of the words but, or, or and to join them. We also got to practice writing our spelling words in shaving cream on our desks – who knew spelling words could be so fun and make our room smell so good. The students have been bagging to do that again. 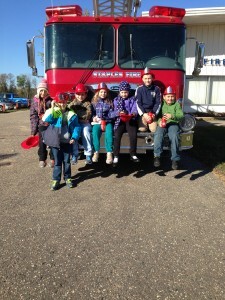 We visited the fire hall and learned all we could about fire safety and what we can do to stay safe. Remember to check your fire alarms once a month, practice fire drills as a family, and have a decided meeting place if ever you were faced with a house fire. 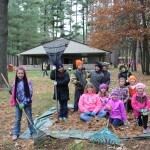 As part of the second school wide work-a-thon our class went to Pine Grove Park and helped spruce it up a bit by raking leaves, picking up sticks, and cleaning up garbage. 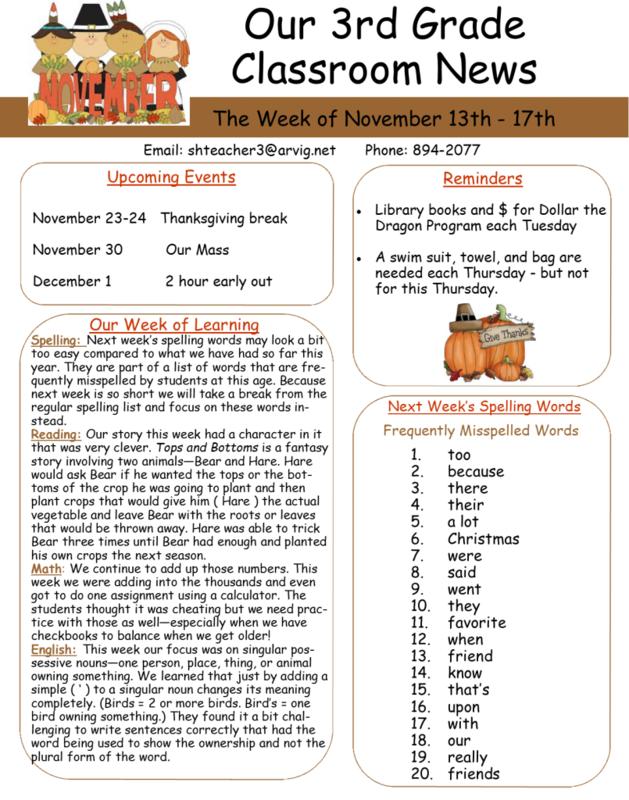 Our excitement and focus will now be on Halloween next week with the school dance to be held on Wednesday. Hope to see you all there in your Halloween costumes! Wow! Three weeks into school already. I’m amazed how fast time goes the older I get. Thank goodness the kids do what they can to keep me young at heart! Today we celebrated our grandparents with a special mass in their honor followed by cookies and fellowship at our school. I love this part of school where young minds meet older and wiser minds! 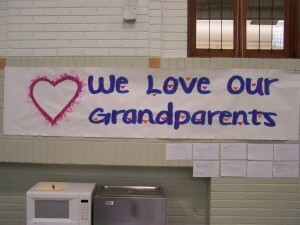 You can feel the energy and excitement as the students show their grandparents around the school or just spend a few precious moments with them talking. We are so glad and blessed to have Grandma Mona here with us again this school year and hope that Grandma Koval will be joining us again soon. Please pray for both of them as they continue to battle major health issues. Life is precious – live it to the fullest! Here’s to a great year in third grade! Happy Easter! Where has the time gone? 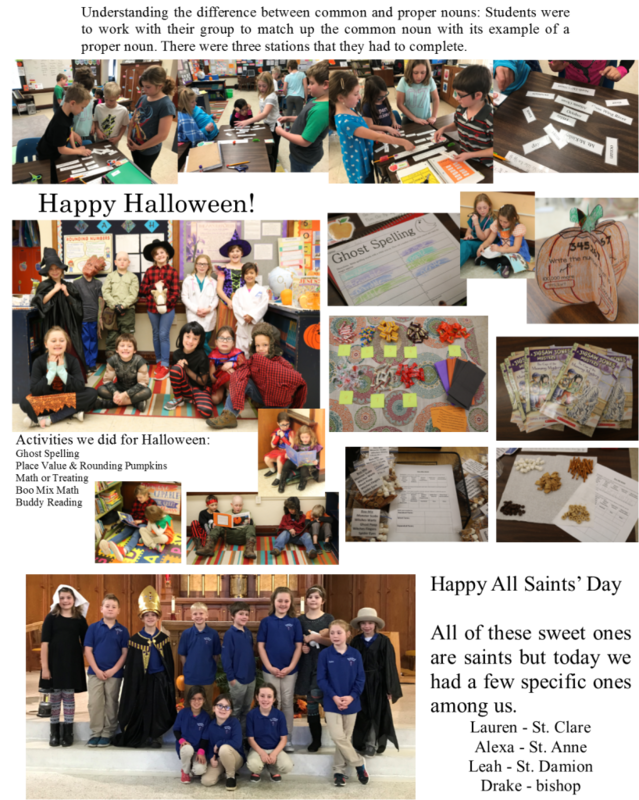 A lot of it has passed since updating this page but it is not for the lack of things happening in the third grade classroom – just time slipping by way too quickly. In math we finished our unit on fractions. The third graders were so surprised that it wasn’t as hard as they had thought it would be when we first started. 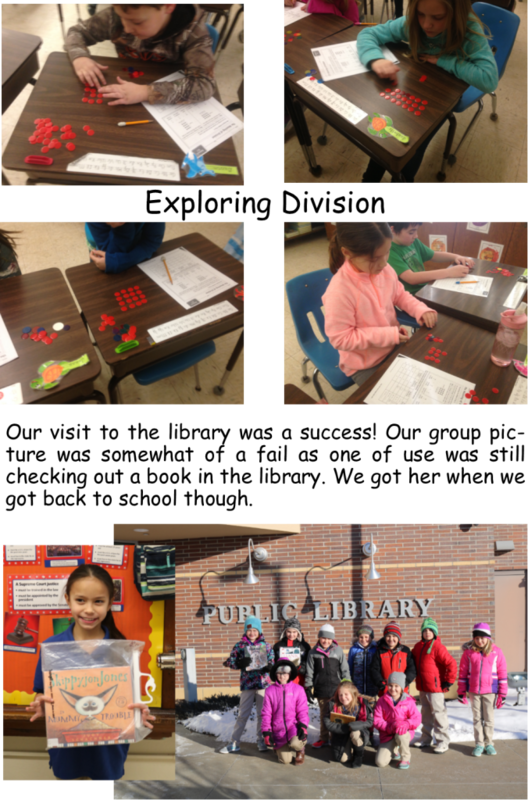 The things we worked onwere showing different ways of representing fractions, finding parts of a group, finding fractional parts of a group, showing equivalent fractions, comparing and ordering fractions , adding and subtracting fractions, and mixed numbers. It was easy for us to move right in to measurement since it relates so well to fractions. 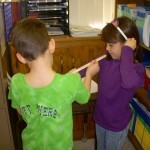 We practiced measuring to the nearest inch and half inch – finding things in the classroom and measuring them with rulers. We also spent some time reading a thermometer in Fahrenheit and Celsius. This got a bit tricky as degree markings can change from one thermometer to another but the students understood the basics and had a lot of fun with the lessons. 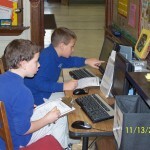 We have also found some time to practice for the MCA math test coming up in a few weeks. We are now into telling time to five and one minute intervals….busy and smart little beavers! Our reading unit had us look at what makes people, places, and animals unique and one of a kind. The stories led us into many discussion about what makes each one of us unique, what sets us apart from the rest, and just how awesome God is to make us all so different yet so much the same. I just wanted to thank all of you who kept Curt in your thoughts and prayers these last few weeks. We definitely felt and appreciated them. He is healing as expected – thank you God! We finished an amazing story in our reading called “A Symphony of Whales”. It’s about 3 whales that find themselves trapped under the ice and how an Alaskan community does everything in their power to help keep them alive until they can be saved by a Russian icebreaker. 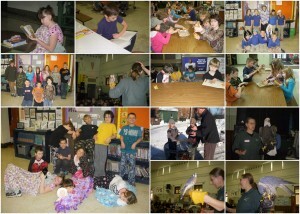 It is a lot like the movie “Big Miracle” – an excellent movie based on actual events that happened in Barrow, Alaska in 1988.In Science we have been learning about different classes of animals such as mammals, reptiles, and amphibians and what makes each class special and unique from the others. 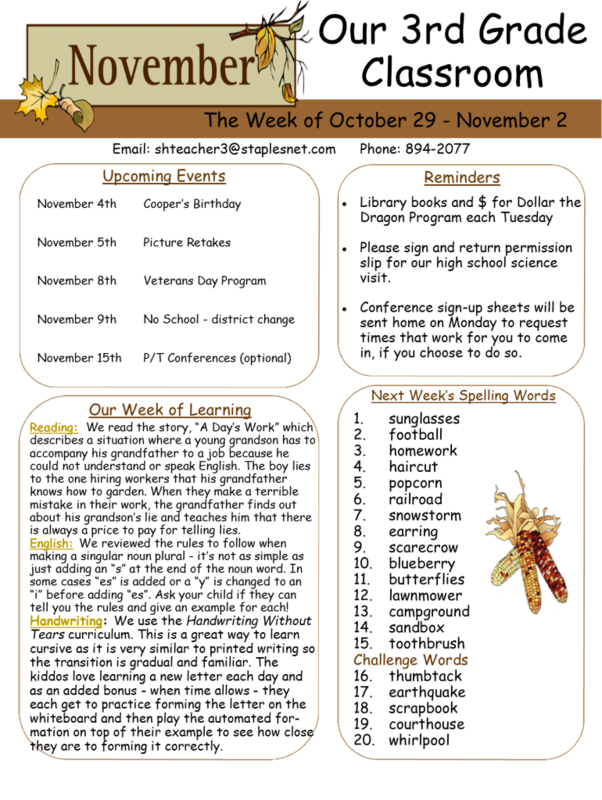 Next week we will talk about animal adaptations and what certain animals have or do to protect themselves from predators. We continue to use our multiplication facts to understand division and will begin learning about fractions in the next few days. 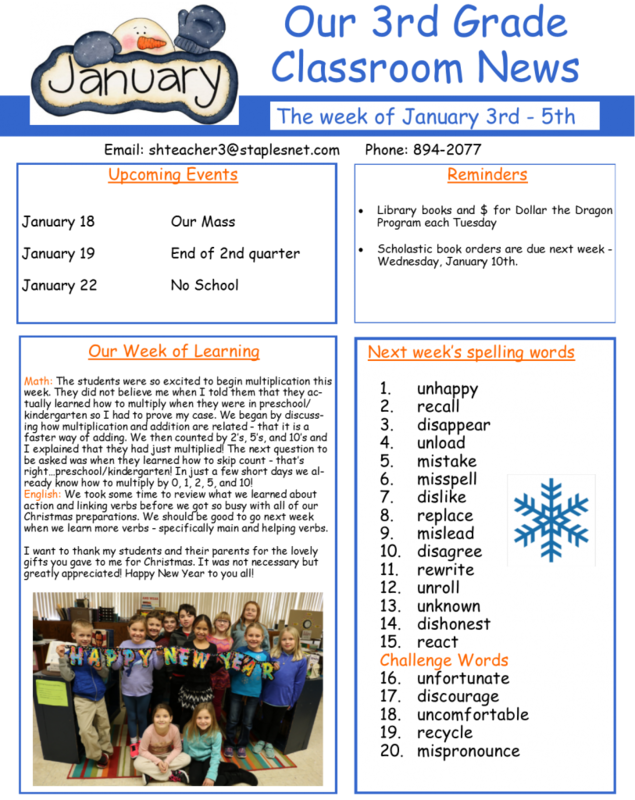 In English we end our unit on verbs by learning about irregular verbs – verbs that, when you talk about the past, the past tense is not formed by adding the usual -ed ending – the word changes completely as in the irregular verbs go, went, and have gone. We will end our week by celebrating one of our favorite holidays – Valentine’s Day…… Happy Valentine’s Day everyone! It is hard to believe that not only is it the end of January already but it is also the end of another quarter. 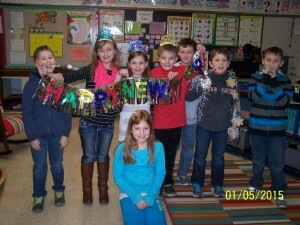 This new year continues to bring a lot of fun into our classroom. In social we learned about economic resources by reading the book The Goat in the Rug. 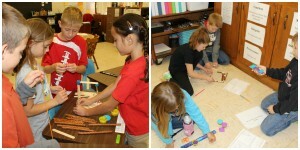 We were focusing on the economic resources that are involved in making a woven rug. Three resources involved are natural resources, human resources, and capital resources. The natural resources are those things found in nature – in this story they were the berries, nuts, goat’s hair, and water. The human resources are the people who are doing the work – in this case – the weaver. The capital resources are the tools and equipment that are used to produce something and can be used over and over without being used up – in the case tools such as shears, carding comb, spindle, large pots, and a loom. We were all amazed at just how much goes into making a single product. In reading we read a play called Pushing Up the Sky. It is a Native American Legend about the sky at one time being so close to earth until the chiefs all got together to push it up and out of the way with long poles. We spent two weeks on this story as it led to many exciting and extra things to do. 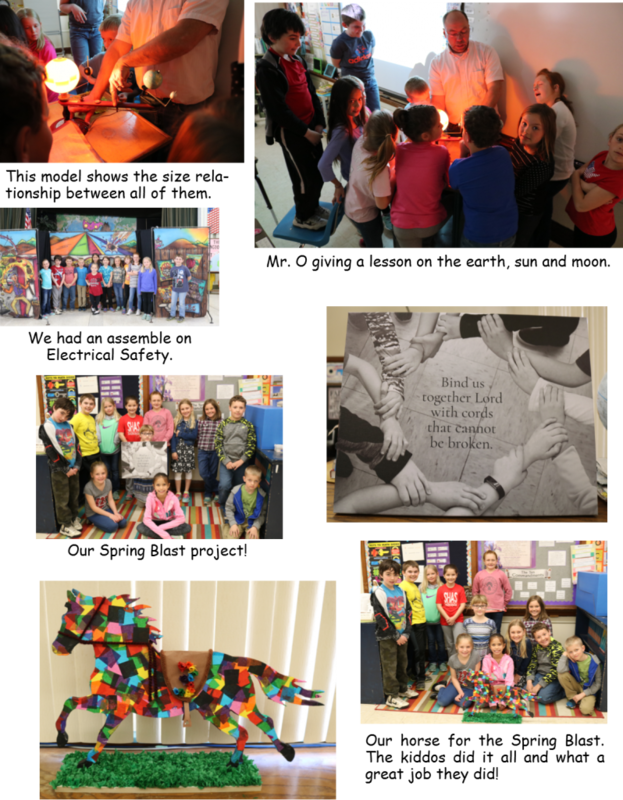 We learned more about the history behind totem poles and each student made one by using animals that represented each family member to tell the story of their own family. We also learned more about the 88 constellations in the sky and how they came about. Our discussion involved talking about an astronomy class I took in college and being able to go to the planetarium to see all of the night sky, realizing that there was so much more out there than one could imagine. They were so excited to make paper telescopes and punch out tiny holes on black paper of a few constellations to gaze at that I think we have a few future astronomers among us in third grade! In honor of Martin Luther King Jr., I felt it important to first familiarize them with words such as segregation, equality, diversity, boycott, and protest that they would hear again and again about what he was trying so hard to fight for and against. We read a story about his life and then listened to his famous speech – “I Have a Dream”. We talked about why he was giving this speech and from pictures in the book the students could tell that he gave it at the Lincoln Monument. One of my students says, “I know why he gave his speech there – it’s because Lincoln stopped slavery so for him and what he was trying to do – make everyone equal – that is what Lincoln was trying to do too.” Let me tell you…a very proud moment for this teacher! We have talked many different times about Lincoln being the president that ended slavery but for this student to connect the dots of these two men was amazing. To be honest, I don’t know that I ever really connected the dots or even gave a second thought as to why he chose that spot to give his powerful speech. I just hope that the feelings my students have right now about treating others as equals and that skin color is just that and nothing more carries on throughout their whole lives. God created all of us and He makes no mistakes! Happy New Year! Before the break we celebrated with a wonderful school wide Christmas program. 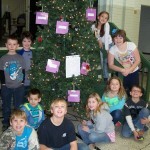 All of the students did a “super” job sharing the true meaning of Christmas. 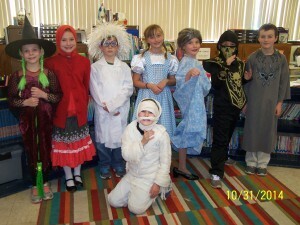 The Third Graders had fun being clowns, baby dolls or raggedy Ann and Andy. 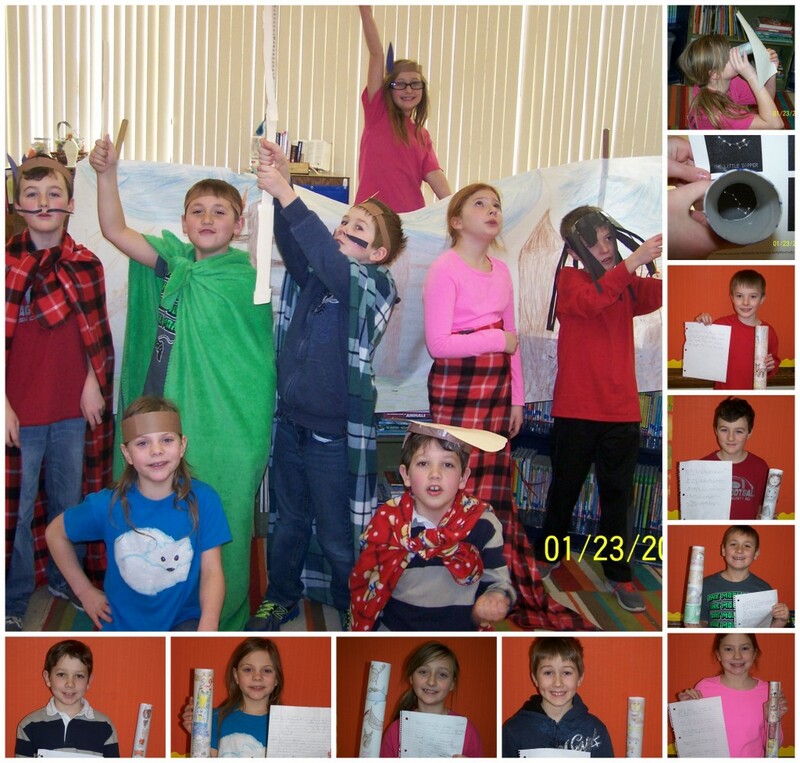 We spent the week traveling around the world on the Polar Express experiencing “Christmas Around the World”. We stopped in Canada, Mexico, Spain, Germany, and England to see how they celebrate Christmas and we did a craft in each spot to remember their tradition. We had our own party by exchanging gifts, eating good food, and taking lots of pictures! We also got to make apple pies in the church basement with some parishioners from the church. This has become a tradition for us and one that we look forward to each year – it always produces yummy results! We hope the holidays were filled with fun, family, good health, and God and we wish all of you the best in 2015! Happy Advent everyone! 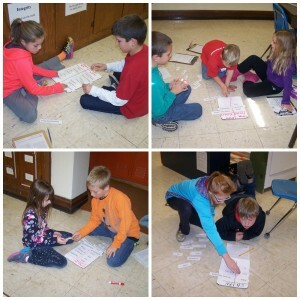 Not only are the third graders preparing for Christmas and the birth of Jesus they have also been very busy learning their multiplication facts and doing it in a fun way with “Times Alive – Times Tables – The Fun Way!”. It uses stories and pictures to help students learn the facts and is especially helpful to those who are visual learners. I can’t believe how quickly they have caught on to all of the facts. 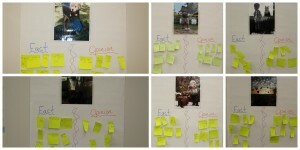 In social we did another time line. This time we focused on a 100 year time line and based it around Christmas. We researched the last 100 years to see what the top Christmas toys were for kids in each decade. 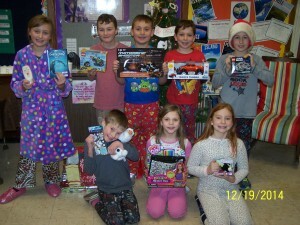 Each student was to find two toys from their decade that made the list on what children had wanted for Christmas, copy off pictures of the toys, and type something up about each one so that they could be added to the timeline. They came up with the idea to display their time line as a Christmas tree. Many gifts on the timeline are still popular today – timeless treasures! We had two special guests come to our class this week. The first was a CLC nursing student named Kyle Stene. He shared some important information with us about dressing and staying warm this winter season. 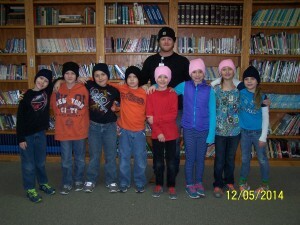 He came baring gifts as each student was given a warm hat to take home. The next was a group of students from the high school and their instructor Brian Schornack who teaches Intro to Ag. Machines. Each of his students wrote their own story that was about Ag. related careers. 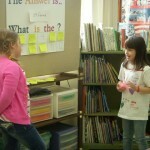 The students paired up with each other and their stories were shared. Some of the third graders even got to color a few of the pictures in the book that was read to them. The last story we read in reading was called “The Gardener” which was written in the form of friendly letters. We decided it would be fun to review the 5 parts of a letter and write our own letters to Santa Claus. 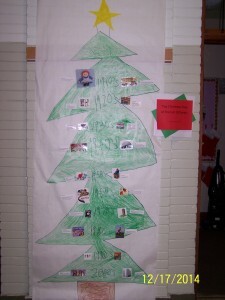 Finally, we read many picture books about “The First Christmas” and discussed what the true meaning of the season is…. it’s not about the presents or the decorations…..Jesus is the Reason for the Season! 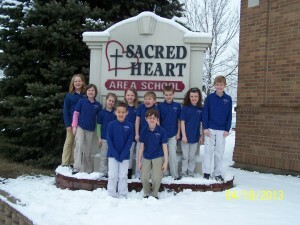 Make sure to come to our Christmas program next Wednesday as the children perform a “Super Gift From Heaven”. 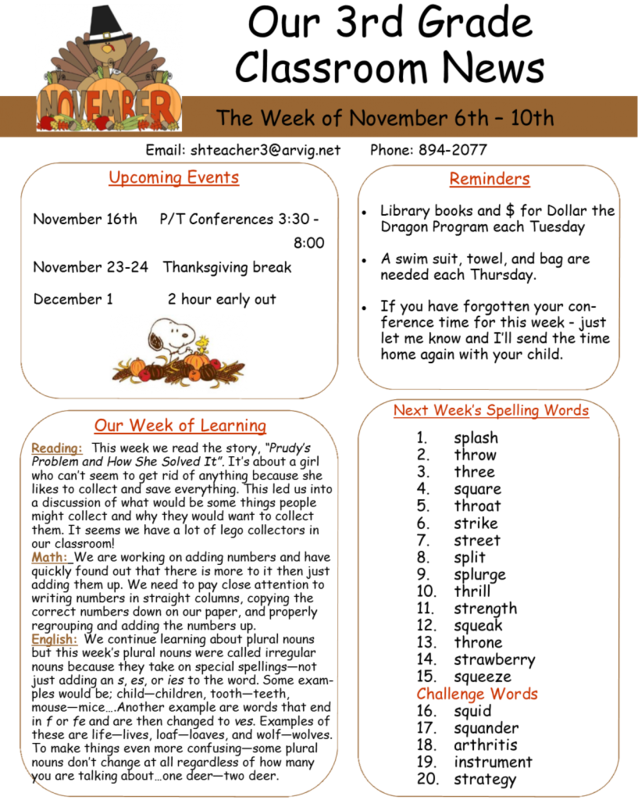 This week we spent a lot of our time learning all we could about the first Thanksgiving. The students made models that helped them learn more about the Pilgrims, their voyage to the “New World”, and their settlement in Plymouth. The models also helped them compare the Pilgrims’ way of life to that of the Wampanoag, the Native Americans they encountered upon their arrival to their new home. 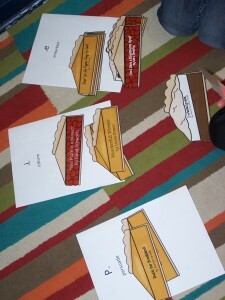 We also spent some time with the Scholastic interactive lessons on the First Thanksgiving. 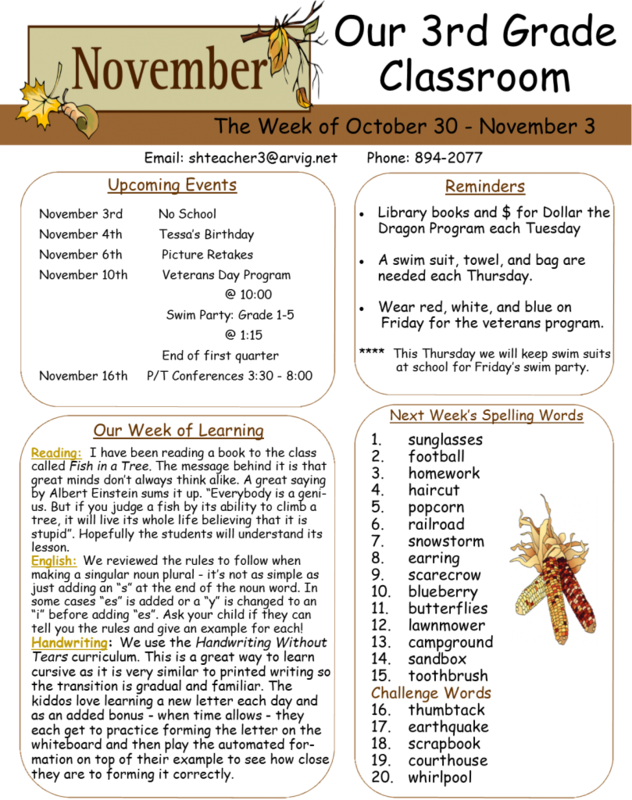 These lessons focused on “The Mayflower”, “Daily Life for the Pilgrims and Wampanoag”, and “The Feast”. There was also time for students to divide into 2 groups and read through 2 different plays that they worked on and made props for to share with the other half of the class. 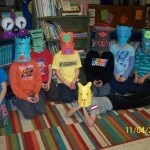 I think this was their favorite part – they are a crafty and creative bunch. In math we finally started the chapter on multiplication. They are already pros at multiplying by 0,1,2,5, and 10. Some are ready to multiply even bigger numbers – how exciting! 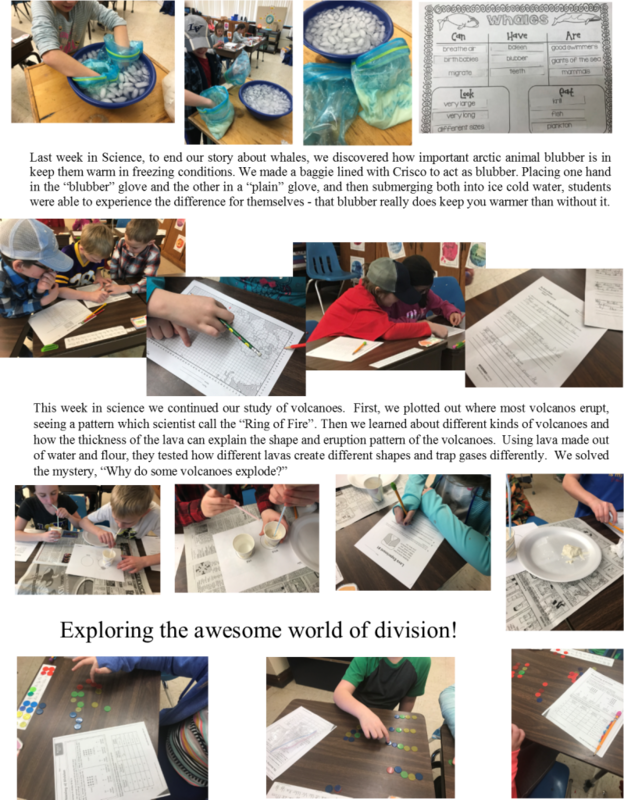 In social the students spent the last few days making models of different land forms out of clay, painting each one, and labeling them when they were dry. 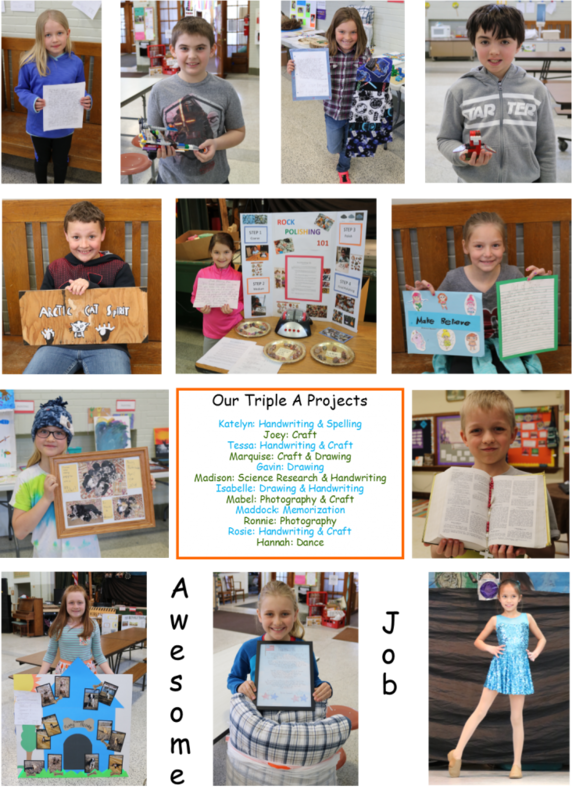 I kept telling them that projects like these were out of Mrs. Mc’s comfort zone because they deal with potential messes and things breaking. But they had a blast with it and did such a super job that I quickly forgot about that and just watched in amazement at how talented they are in what they created with a little bit of clay and some paint. I hope you all have a blessed Thanksgiving break – see you in December – can you believe that already?! We went off of our regular schedule a bit this week so that we could focus on the real importance of what Veterans Day is all about. 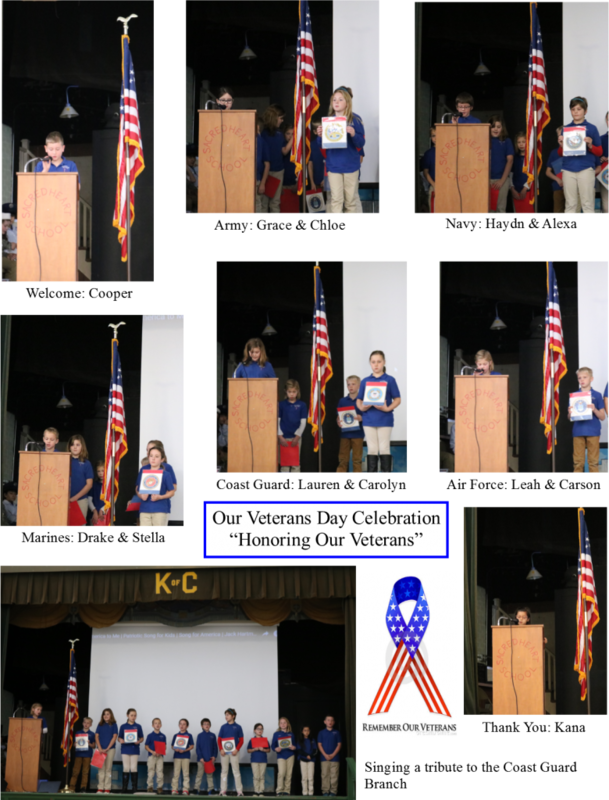 We read a story called “The Veterans Day Visitor”, learned about the origin of Veterans Day and how we can remember and honor those who have served. We also got to honor our veterans at a special program just for them – our way of saying “thank you” for all that they gave up and did so that we all could live in a free country. In English we learned about singular possessive nouns which seemed complicating to them at first but when we broke it down word for word and found out that it meant one person, place, or thing owning something it became less confusing for them. We practiced writing sentences about animals owning things such as; The pig’s tail is curly. The wolf’s cub is very small. At times we wanted to use the noun and make it plural instead of possessive ( The forests have many trees.) 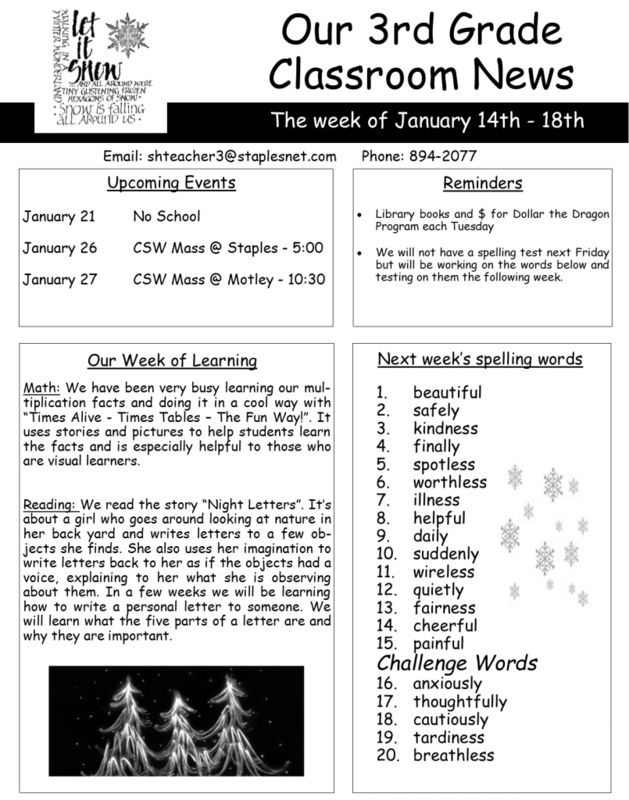 but we will continue to work on this next week when we learn about plural possessive nouns. 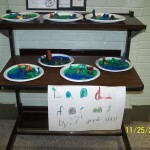 In social we are working on land forms. We talked about all different types, compared and contrasted two different ones (river/ocean – mountain/hill – volcanoe/geyser – island/peninsela), shared our findings with the rest of the class and then chose one land form each to research and write 6 facts about it. 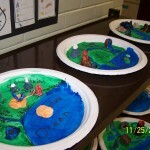 Next week we will share our facts and end our unit by making land form sculptures. Happy fall (or should I say winter) everyone! So the Third Graders came back from specials the other day and thought they would try to scare me with the paper masks they had made in Art class. Although some looked pretty scary I couldn’t get over how awesome they were. All were done neatly and were very colorful. My reaction to the masks was of wonderment and amazement which was not what they had in mind. To cheer them up I told them I would take a picture of them with the masks on but they would have to give me their scariest faces. They didn’t think that was funny either – oh the disappointment they had in their teacher…! Academically, we continue to tackle regrouping in addition and now subtraction, learning the tricks on how to change singular nouns into plural nouns in English, reading stories about problems characters face and how they go about solving them, and in social we have been studying maps. We have learned the cardinal and intermediate directions of the compass rose, practiced giving directions from one place to another, and what is needed in making a map by learning the acronym “TODAL”. This stands for the 5 basic parts that each map should include – Title of what the map is about, Orientation (compass rose), Date of when the map was made, Author – who made the map, and Legend (map key) – symbols that stand for what is on the map. 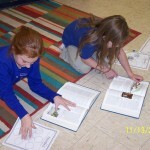 They also learned that the word “cartographer” means one who makes maps. 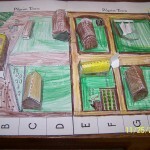 We thought it would be fun to become cartographers and put what we learned into making our own maps. So for the last couple of days each of them have been busy making their own map called Barefoot Island including anything they thought would be important. By the looks of them I would say we may have some real future cartographers! It was great meeting with all of my parents last night at parent/teacher conferences. Your children are doing amazing and I am truly enjoying every minute with them. Please remember that I am always available if you have questions about anything. Happy Halloween Everyone! Be safe! It has been a while since updating our news. The reason for that is my family and I went to visit Mickey and his friends on our second Disney Cruise over MEA. The weather was beautiful with plenty of hot, sunny days. I wanted to share them with you so I brought some of the good weather home with me – just hope it lasts. 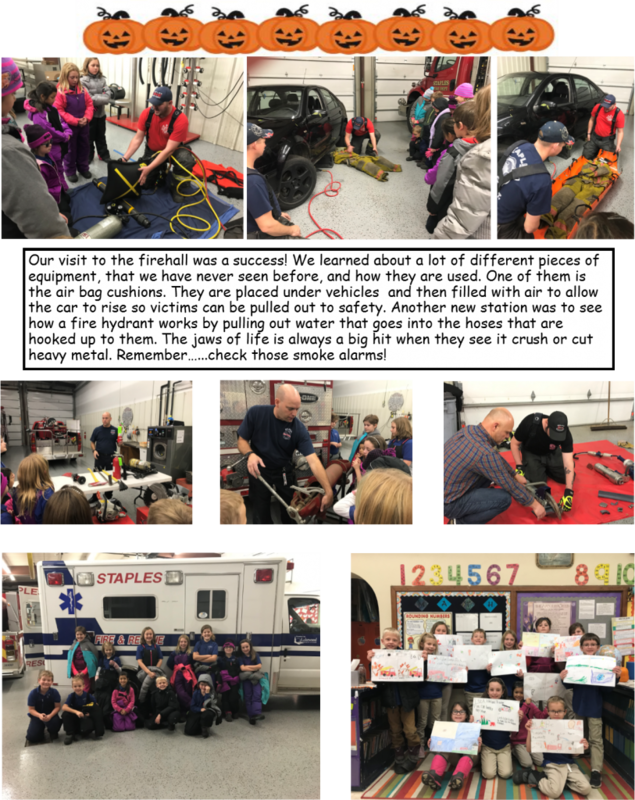 While I was gone the students were busy visiting the fire hall and learning about what they can do to prevent fires and what to do if a fire happens at home. They then took part in a 2 day ( 1 hour each day) presentation titled Ridiculous Puppetry. 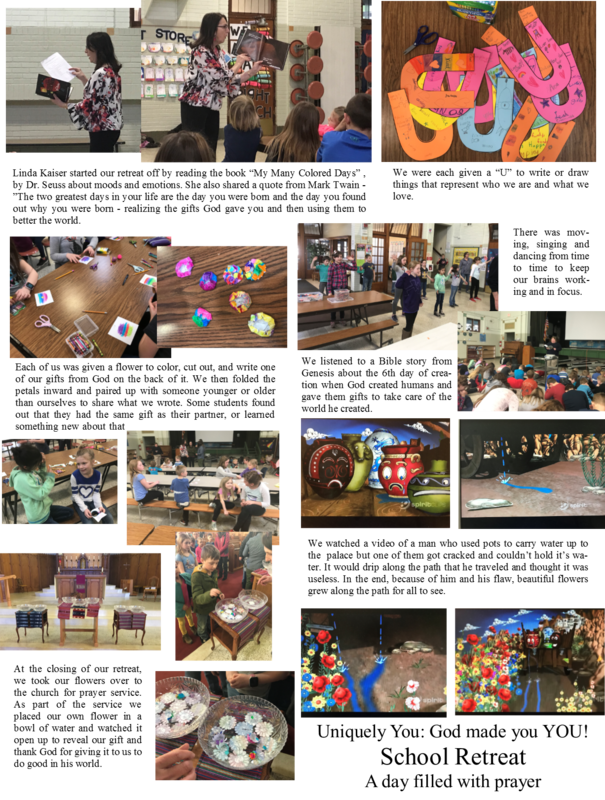 During these 2 sessions the students learned how to make just about anything become a puppet of sorts using their imagination to give it a voice and make it move. 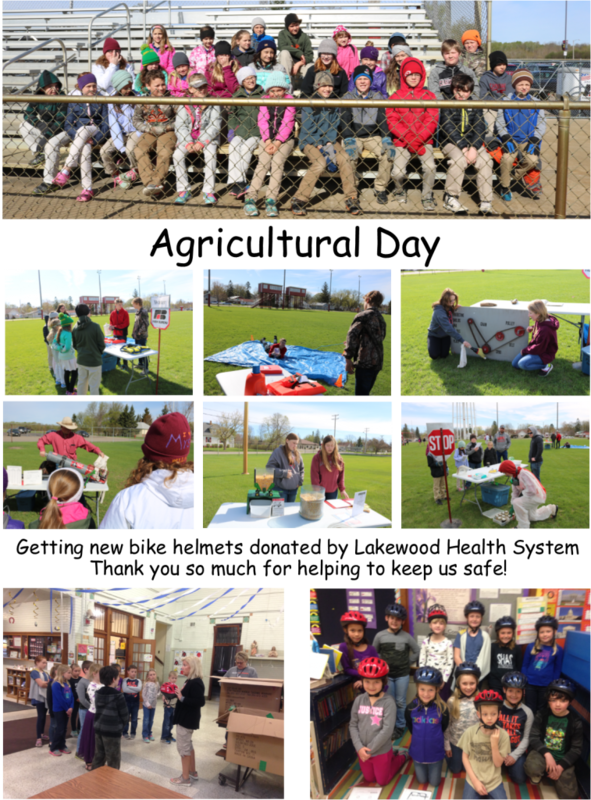 As part of the first school wide work-a-thon our class went to Pine Grove Park and helped spruce it up a bit by raking leaves, picking up sticks, and cleaning up garbage. 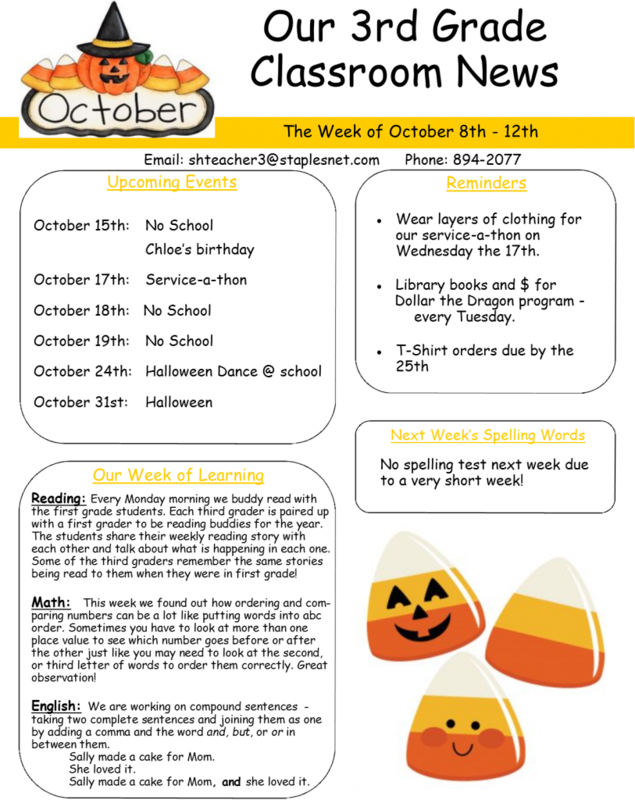 Our excitement and focus will now be on Halloween next week with the first school dance to be held on Wednesday. Hope to see you all there in your Halloween costumes! The Third Graders have been very busy since school started. We finished a reading unit of 5 stories talking about money, how to earn it, what to do with it after you have earned it, and what happens with it when you put it into the bank. We learned what interest means and thought that it was pretty cool to get even more money out someday then what you put in because of the interest you made on your money. We spent many, many days tackling rounding numbers in math. It got a bit tricky when a thousand number needed to be rounded to the nearest ten or hundred but we made it through and will keep practicing throughout the year. 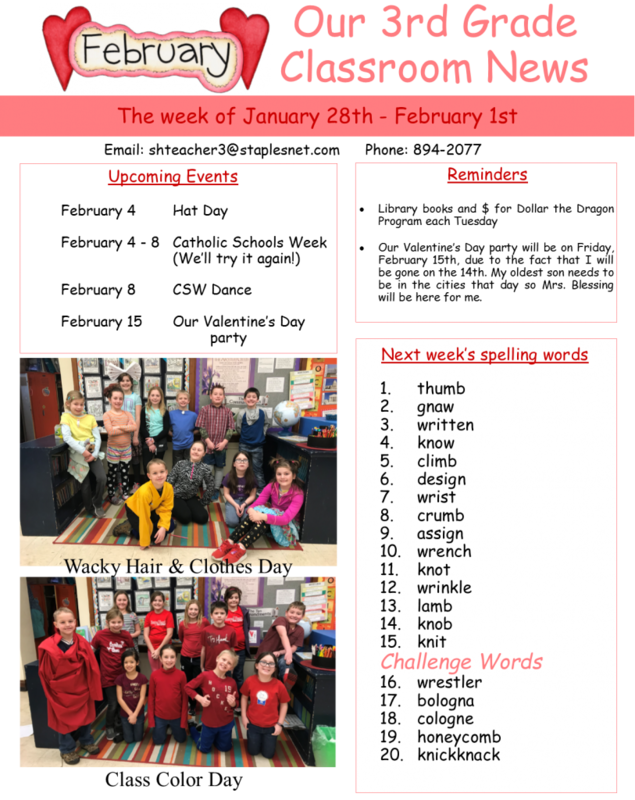 In English we found out that compound sentences are a lot like compound words….taking two simple sentences and making them into one sentence by just adding a comma and one of the words but, or, or and to join them. 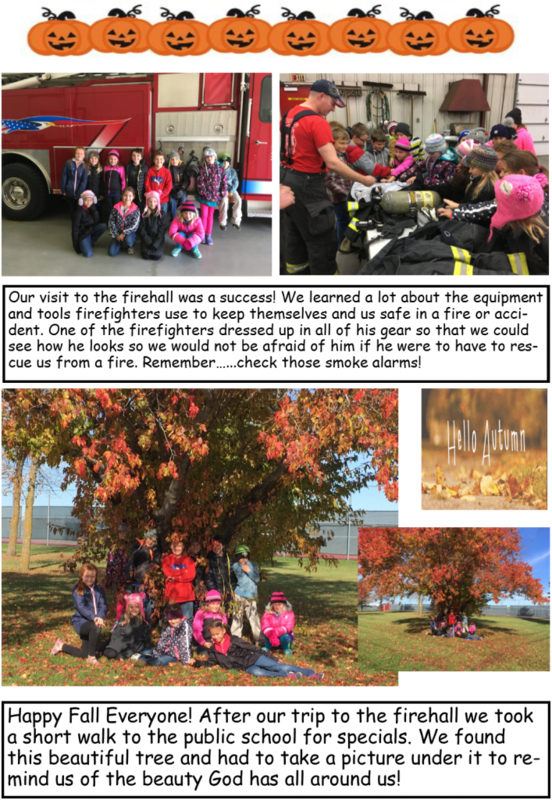 We are excited to go visit the fire hall tomorrow and learn all we can about fire safety and what we can do to stay safe. Remember to check your fire alarms once a month, practice fire drills as a family, and have a decided meeting place if ever you were faced with a house fire. We are off to a great start in third grade. 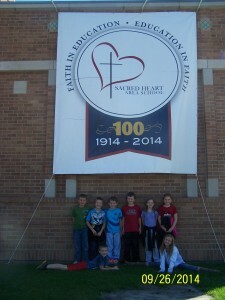 How awesome to be the 100th third grade class here at SHAS – such a huge part of history! 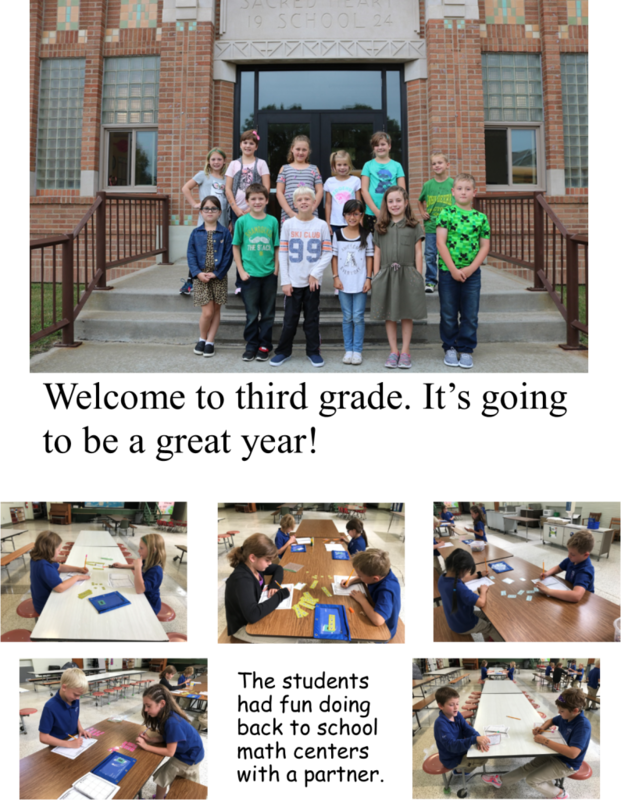 The students have already experienced what a big transition it is to be a third grader compared to all of their previous school years. We have been spending a great amount of time with handwriting by looking at how to form and where to begin each letter. In math we are working on place value up to hundred thousands – writing numbers in three forms – standard, expanded, and word form. In social we are creating time lines of our lives. Watch for them to be displayed soon! Something new this year is our interactive notebooks. 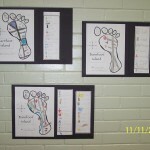 They are divided into sections for each subject in class. All introduction lessons and concepts go into them along with some activity to reinforce and practice what is to be focused on. 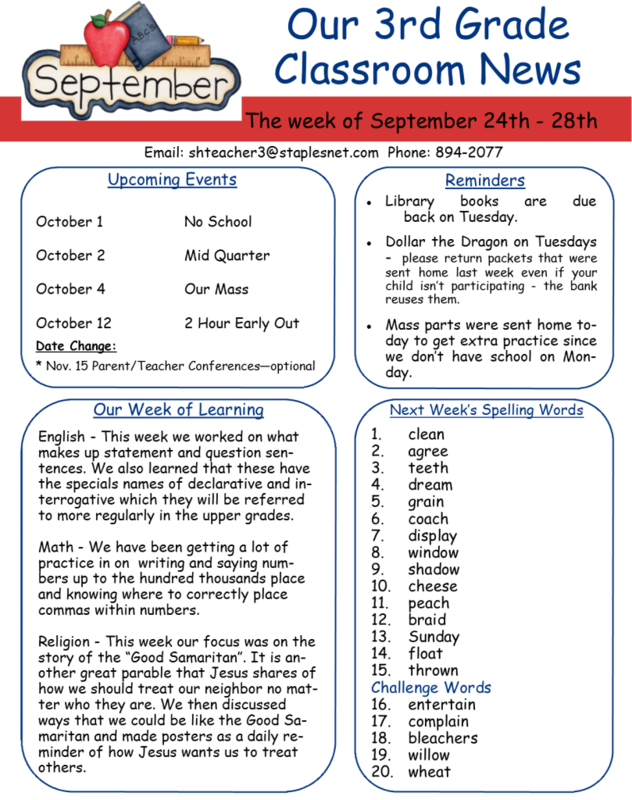 The greatest part is that the students have things all in one place to refer back to throughout the year. I am so excited for what this school year will bring and am loving the time spent with my students. It’s hard to believe that the time has come to say good-bye to another school year and another great group of kids. I have enjoyed watching all of my students grow and hope that they all have a great summer but find some time to do a little bit of reading. Remember that books can take you on many great adventures right from the comfort of your own homes. We will be back in three very short months but until then stay safe and God bless! And then there were 11. That’s right – we got another new student added to our classroom. Again, the girls were pleased to welcome another one of them. We would like to welcome Arissa to our room and our school. It’s hard to believe that we are already into the fourth quarter of the school year. It feels like each year goes by faster than the last. 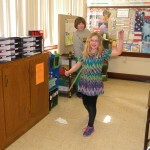 In math we finished up our unit on measurement in the coolest way we knew how – the Measurement Olympics! 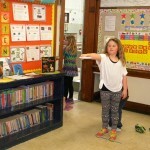 The “Shot Put” was to see how far you could throw a cotton ball, the “High Jump” was to see how high you could jump and mark the spot on a board, the “Long Jump” was to see how far you could jump forward, the “Discus Throw” was to see how far you could throw a paper plate, and the “Javelin Throw” was to see how far you could throw a straw. 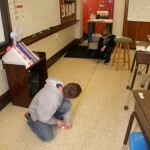 The students were to decide how they were going to measure each distance to the nearest half inch. 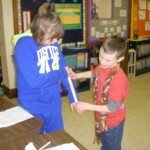 At each station they were given the options of a ruler, a yard stick, and a tape measure. 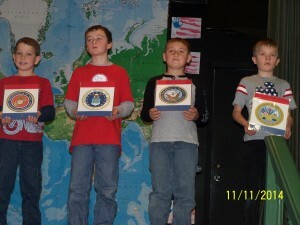 They had a blast doing this and, of course, medals were given out to the top three in each category. Since then we have moved on to telling time to the minute and determining elapsed time to the minute. The students are doing extremely well with this and are so excited to be able to tell me the time at any given time of the day. They also like to try and figure out how much longer they have in doing things before moving on to the next subject. In science we will be wrapping up our unit on animals. We have classified the different animal groups and discussed how the young resemble their adult parents. We will end the unit by finding out what the difference is between traits that are learned and those that are inherited. Only nine weeks left with my cherubs and so much yet for them to learn! 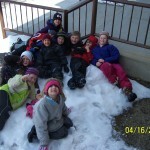 As it snows outside can you even imagine that in 9 weeks it will be summer vacation?! Hey – what do you think of our monster? 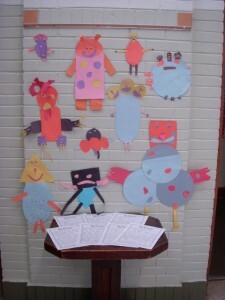 Well, our monster writing activity is in the final stages of publishing. Hopefully, by the next time I update our happenings they will be complete and I will be able to share a picture with you. 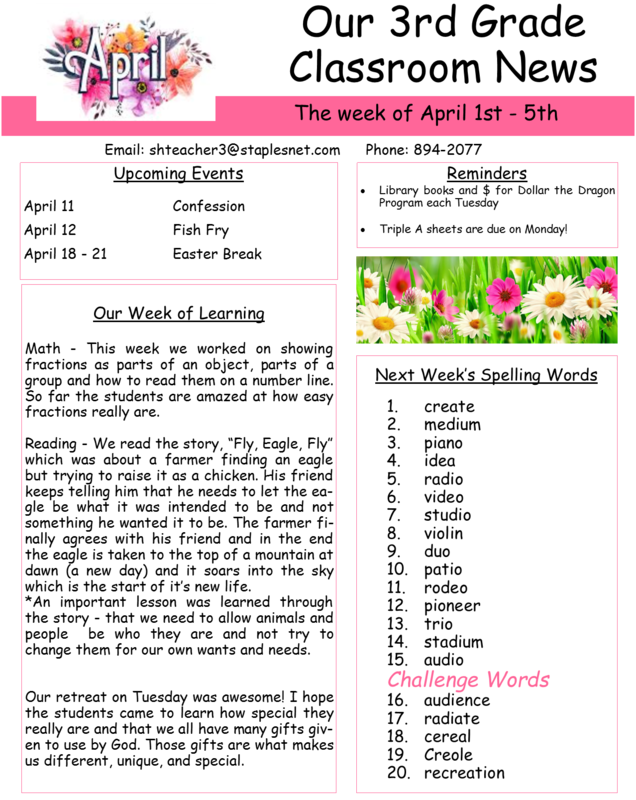 In English we have been talking about pronouns – words that take the place of a noun (she, he, they, them, it, us….) 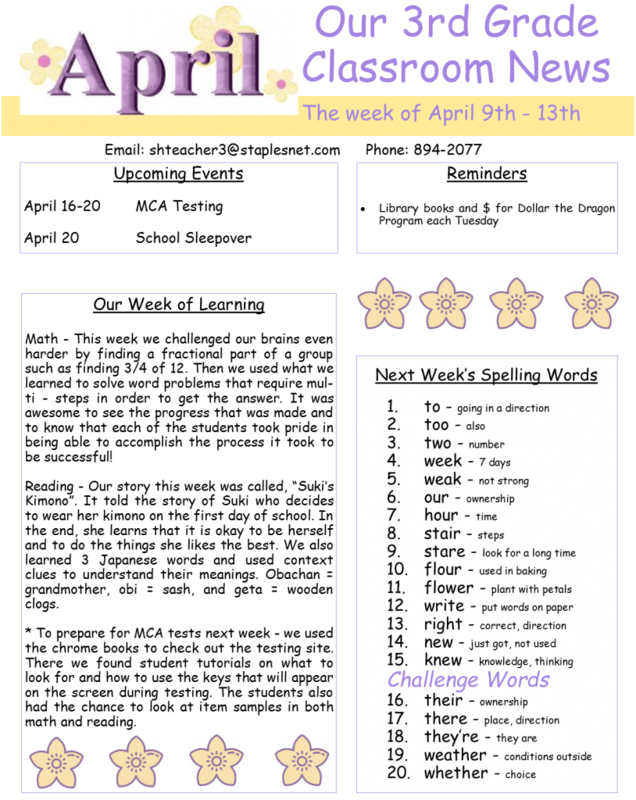 – and looking at which words are singular and which are plural. We also discussed that some are the subject of the sentence making them subject pronouns while others follow a verb making them object pronouns. The students took sentences written on the board with nouns in them and changed each underlined noun into its correct pronoun. This helped them to see that subject pronouns occur at the beginning of sentences and the object pronouns are found at the end of sentences. 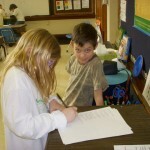 In math we spent a few days talking about temperature and how it is measured. We found out that it can be measured in degrees Fahrenheit or degrees Celsius. We practiced reading thermometers showing both ways, comparing them, and looking at how warm or cold certain temperatures feel. 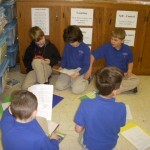 As part of our reading, we have been doing a few literature circles. 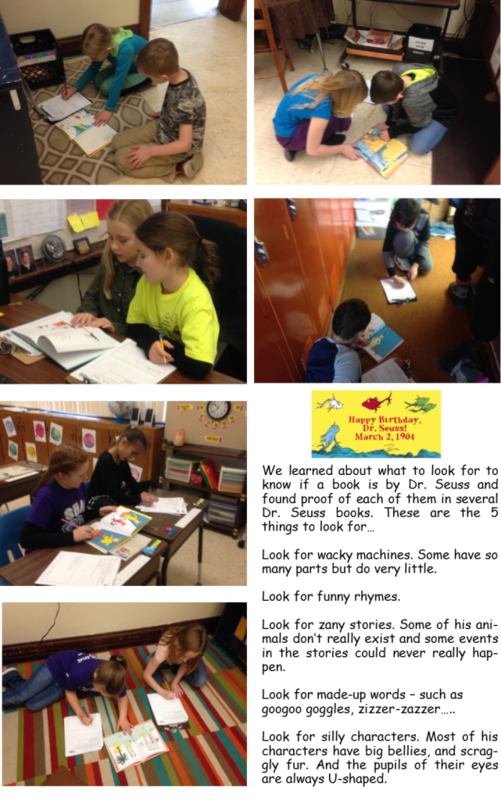 This is where students get in two groups where both are reading different books on their own and reporting back as a group the different things they were responsible for. One person is the “Discussion Director” coming up with questions the group can talk about. Another person is the “Illustrator” who draws a picture relating to what was read and writing why they drew it. Someone else is the “Connector”. They are to find connections between the book and the real world. The “Literary Luminary” is to locate a few parts of the book that the group would like to hear again because it was funny, meaningful, puzzling or important. The last person is the “Word Wizard”. Their job is to look for words that may be unusual, unfamiliar, or words they don’t understand. 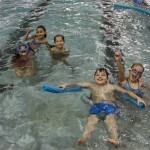 Last week one group read “Sarah, Plain and Tall”, and the other read “20,000 Leagues Under the Sea”. They did a great job for this being only the second time trying it. 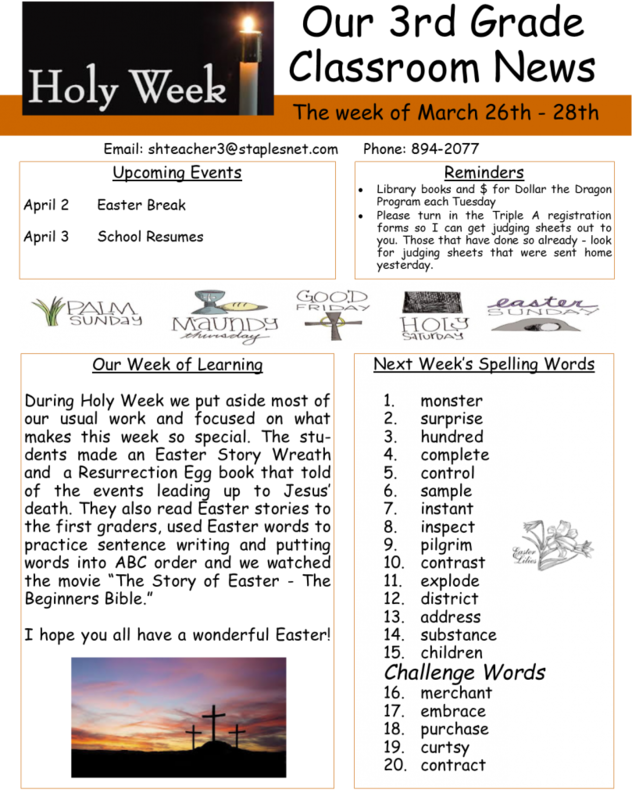 While we continue to be busy, Lent is here so let’s use this time to do better for others and improve ourselves. Discovering two types of pronouns – subject and object pronouns. 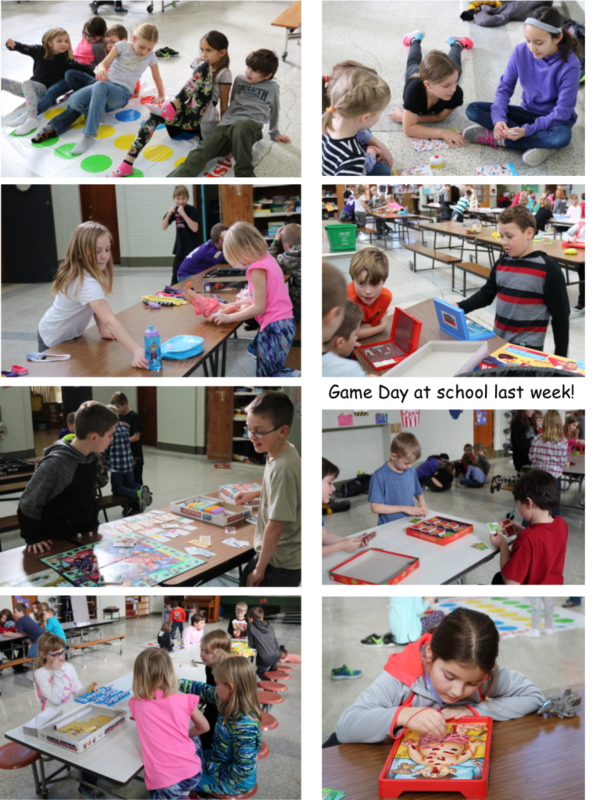 Last week the Third Graders took part in their own Olympic challenges – 6 challenges that tested their abilities to see how much of each they could complete in one minute. 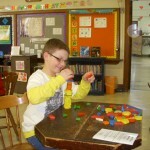 The events included the ball toss, pattern block stacking, name writing, multiplication, jumping jacks, and bean counting. 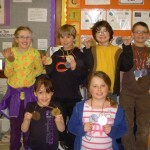 Gold, bronze and silver medals were given out on Tuesday at our in-class awards ceremony. Another Olympic challenge is being planned that will use measurement skills to see how well they do in a math version of the Olympics. 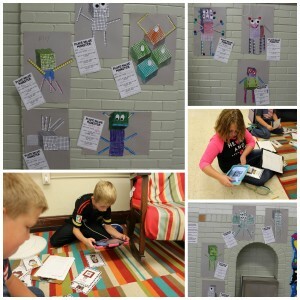 This week the students created their very own Monster Friend out of construction paper as part of a craft and writing activity that we are starting. The students will do an informative writing piece on their monster that will give facts and details on what it looks like, how it acts, what it does, and where it lives. Take my word for it – these monsters turned out pretty cool – nothing like you have ever seen before – I’m sure! Enjoy the beautiful weather we are having, you never know how long it will last! Wow! What a crazy year this has started out to be with freezing temperatures, school closings, and Catholic Schools Week all in one short month. 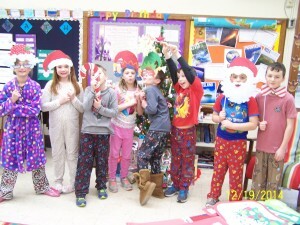 We had so much fun last week dressing up in different and unusual wardrobes -but we all agreed that pajama days was by far our favorite of all. 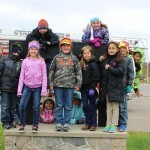 Seeing the raptors from the MN Raptor Center was also a treat especially when it fits right into what we are learning about in science – mammals, reptiles, and BIRDS! 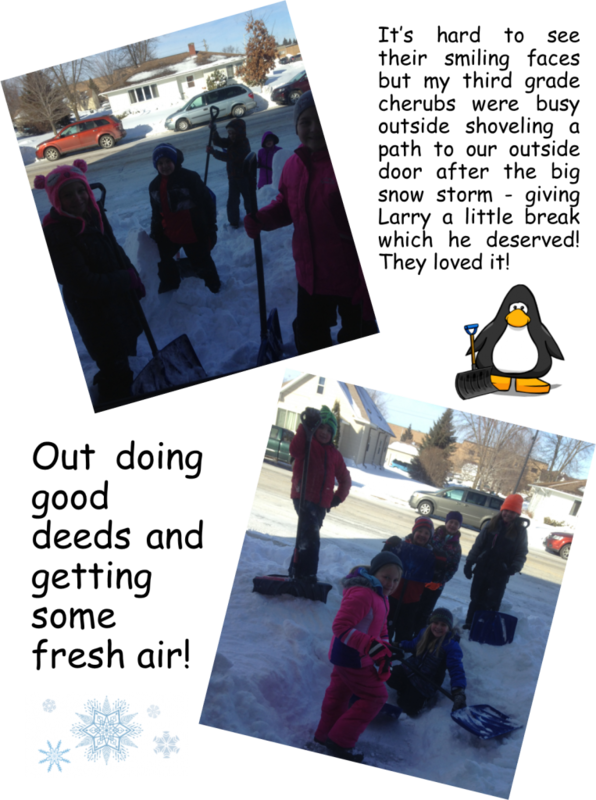 It was a sad day when my students found out that we would not be going sledding last Friday due to the windchill being so cold. I did reassure them that we would make it up and seeing the sleds still in our room each day makes it feel like that day can’t come soon enough! We have completed our multiplication unit in math – (some even going above and beyond doing double digit multiplication!!!!) and have moved on to “fractions”. It’s funny how the students think of fractions as something that they have never used before when in reality they have every time they broke a cookie in half, watched someone cut into a pie or pizza, talked about how many girls compared to boys there are in the classroom, or helped someone bake from a recipe. We’ve just scratched the surface of what fractions are but the students are already excited to learn even more! As I sit here typing away – my students are doing their best with the NWEA reading test – first out of three to take these next two weeks. We are hoping for improvement in all three areas – fingers crossed! 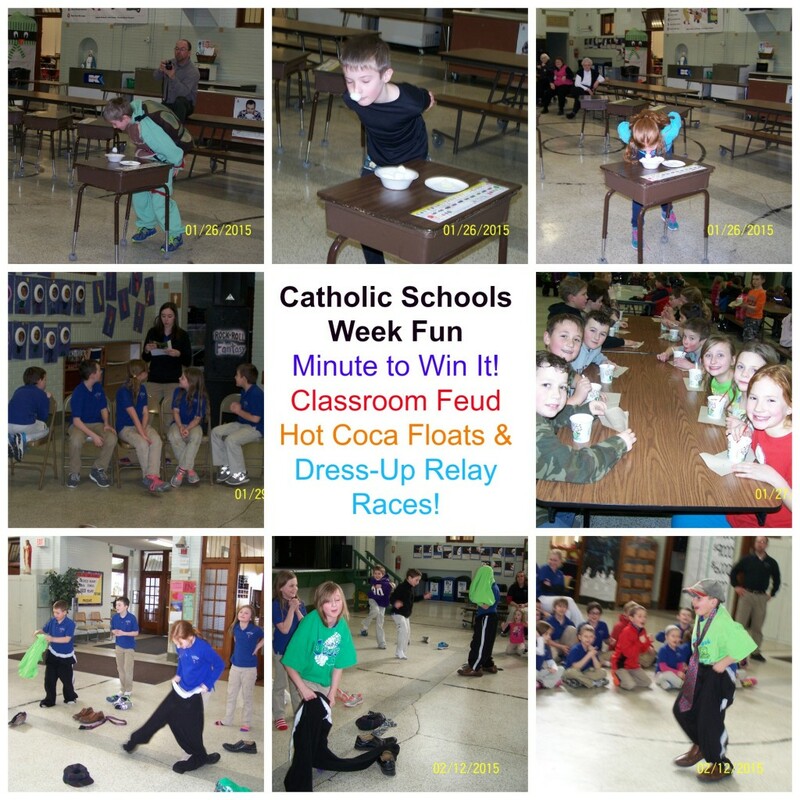 Fun times during Catholic Schools Week! Happy New Year and welcome 2014! This is coming to you late, I know, but not starting school until the 7th and me not being back until the 8th due to the influenza bug is the reason for that. I hope you all enjoyed the holiday and found time to be with and enjoy family and friends. 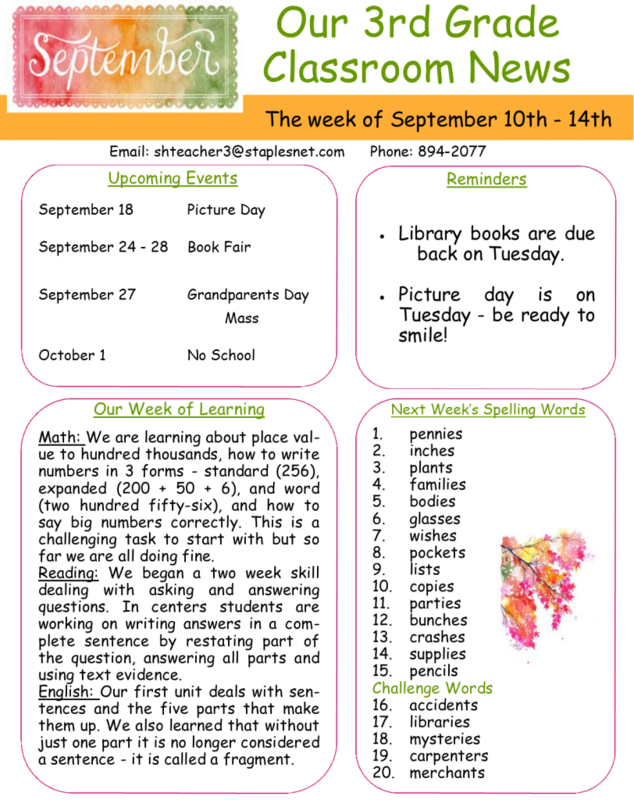 Last week was like the beginning of school all over again but this week we are back at a regular schedule. We continue to learn multiplication facts with “Times Tables – The Fun Way!” , and revisit other areas that we need extra help with. In reading we began a new unit that focuses on how people and nature are connected. Through the stories we will see how humans use natural resources found in nature – their environment – to get what they need in order to live. 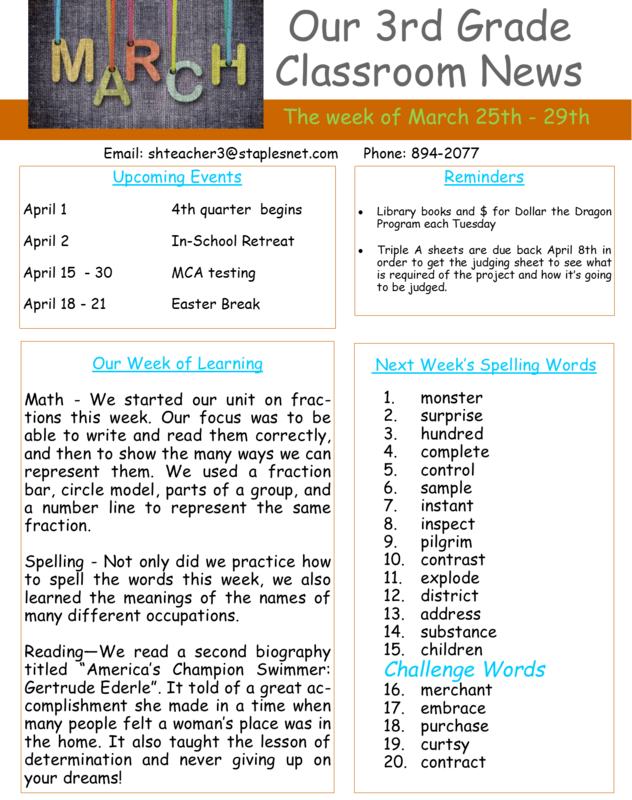 In English we were introduced to action and linking verbs . 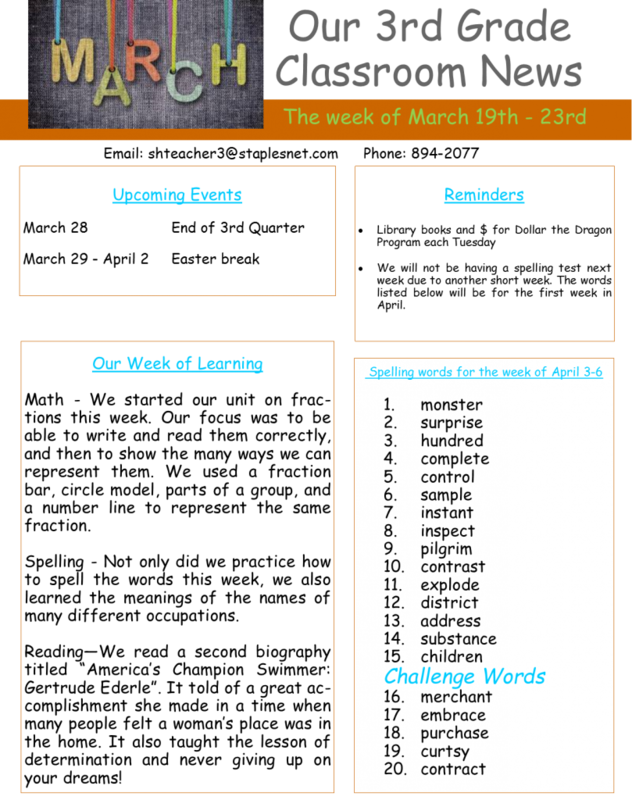 The students found the action verbs easy to identify but couldn’t understand how the words is, am, are, was, and were could be verbs when they don’t show action. It’s hard to understand “state of being” and what that really means. We’ll keep working on it! Finally, in social we are discussing what it takes for people to earn money and realizing that a lot of the money earned has to go to paying for things. We are also talking about the differences between producers and consumers and taking a close look at examples of what each does. Just a reminder… the end of the 2nd quarter is this Friday. 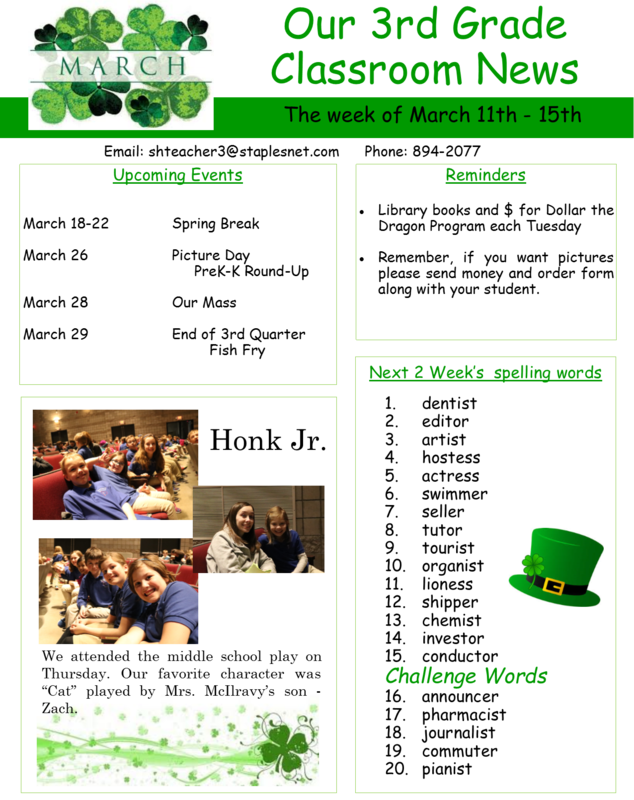 Watch for report cards to be sent home next week. I hope that you all are enjoying the warmer weather and remember to sell those raffle tickets for the upcoming carnival! Well – this is it for us – we say good bye to 2013 with two full weeks of rest and relaxation before we welcome in 2014. 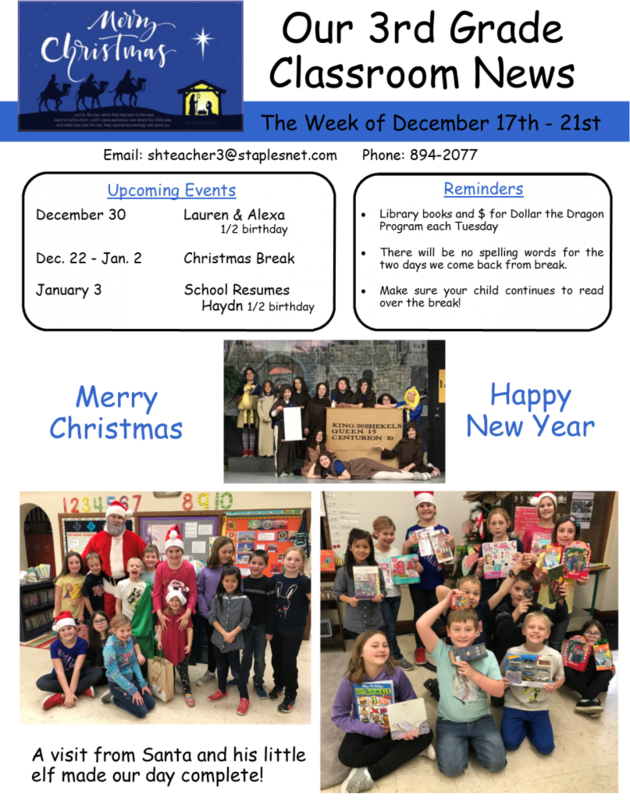 Third Graders just remember why you are home – yes it is Christmas break but it is all about Jesus’ birth – our greatest gift! We ended our month with a school performance of a spectacular play sharing the Good News to those that were there. We hope that this season finds all of you surrounded by many blessing. Merry Christmas and God Bless! 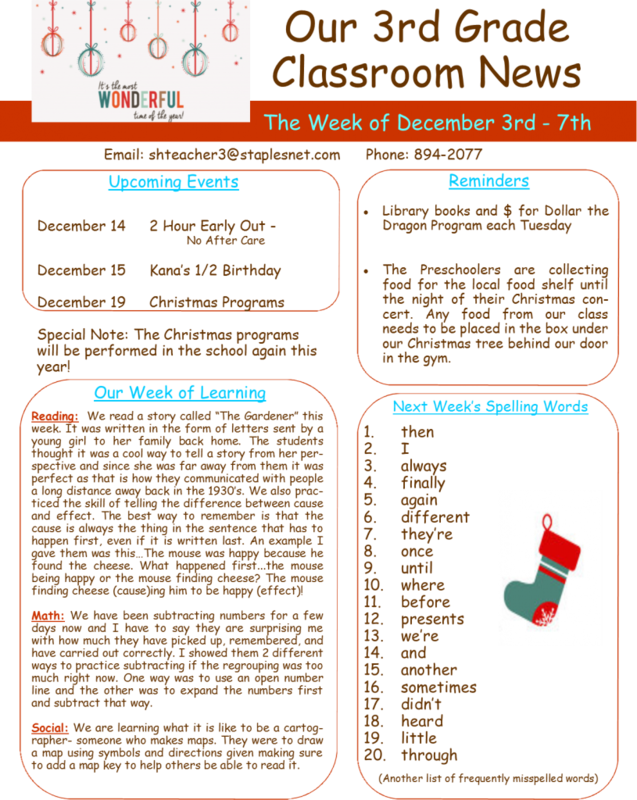 Tis the Season for many things to be going on and even more things to get done. Well, it’s no different in the Third Grade classroom here at SHAS. First of all, we are so excited to say that, as a school, we were able to collect 40 pairs of brand new pajamas to be given to those in need this Christmas season. Thank you to all who helped make this possible. We also headed up a Christmas card project to send out cards to those in nursing homes around the area hoping to give a little cheer to those who may not have family close by for the holidays. 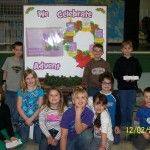 To start out each new week of Advent the Third Graders were in charge of teaching the whole school something new about, or relating to, Advent. 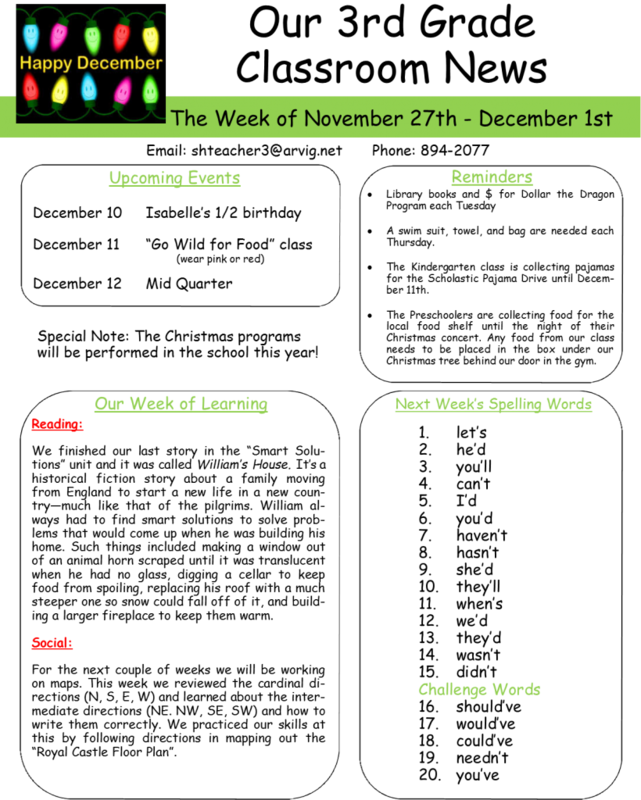 Week One was about the meaning of Advent and its many symbols. 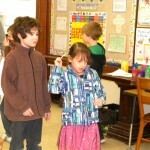 This week they took part in a presentation entitled “Teach the Children”. It’s about Santa telling the children what the symbols of Christmas really stand for and what the true meaning of Christmas is all about. It is not about him and the presents we receive but instead about the birth of Jesus and God giving Him to us as the ultimate gift. 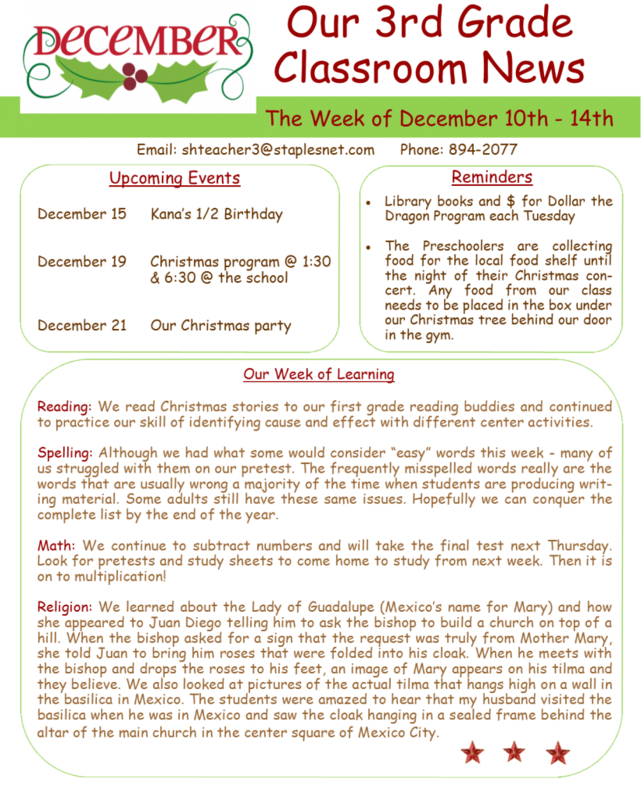 We are busy learning the songs for our Christmas program which will be next Wednesday. Come celebrate with us – we will be the ones dressed like angels! I have found that there are two things my students look forward to when entering third grade. One is learning cursive writing and the other is multiplication. While cursive writing is an on-going process, we have now entered into the fascinating world of multiplication. The students were surprised and amazed that, in a way, they already knew how to multiply and have been doing it each time they skip count and do repeated addition. It is wonderful to know that I have now made all their dreams come true! 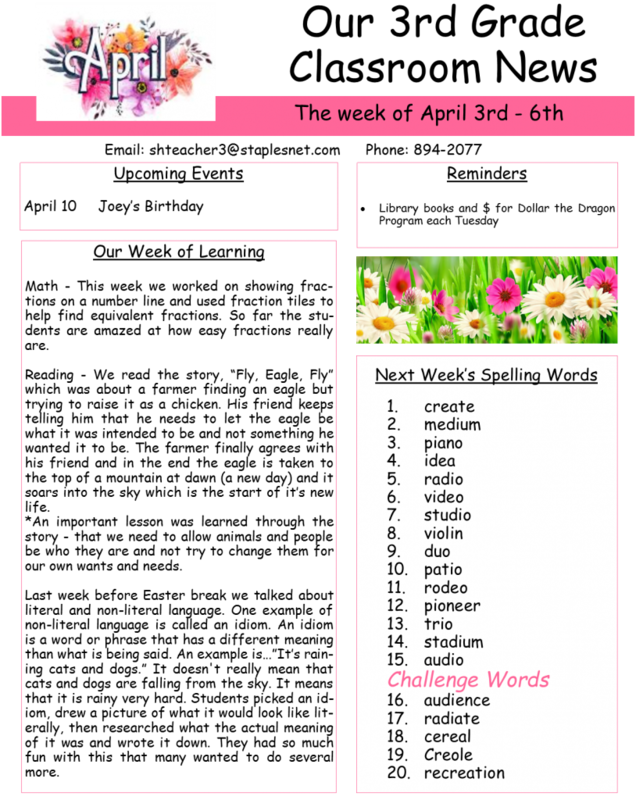 Last week English became a bit confusing for us as we continued with nouns – which, in itself, is easy enough. 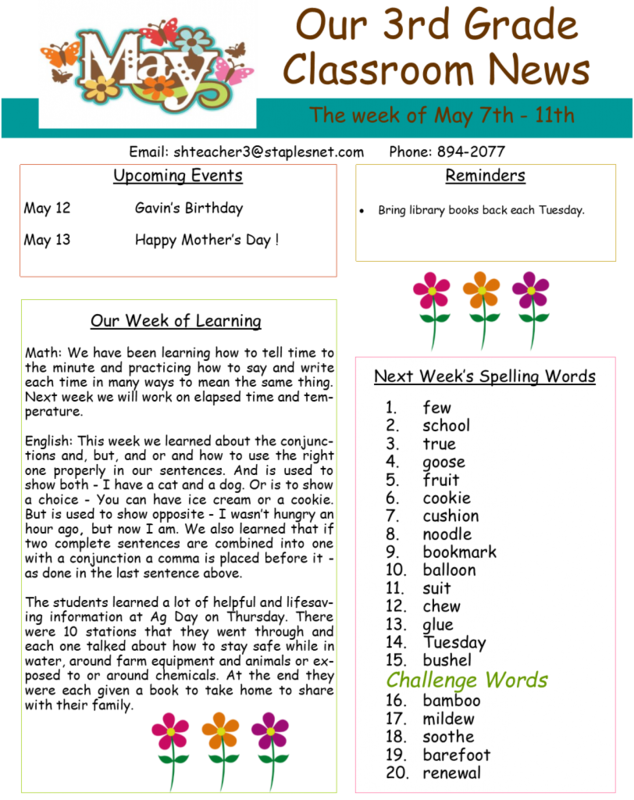 We first started talking about proper nouns a few weeks ago and then moved on to plural nouns. 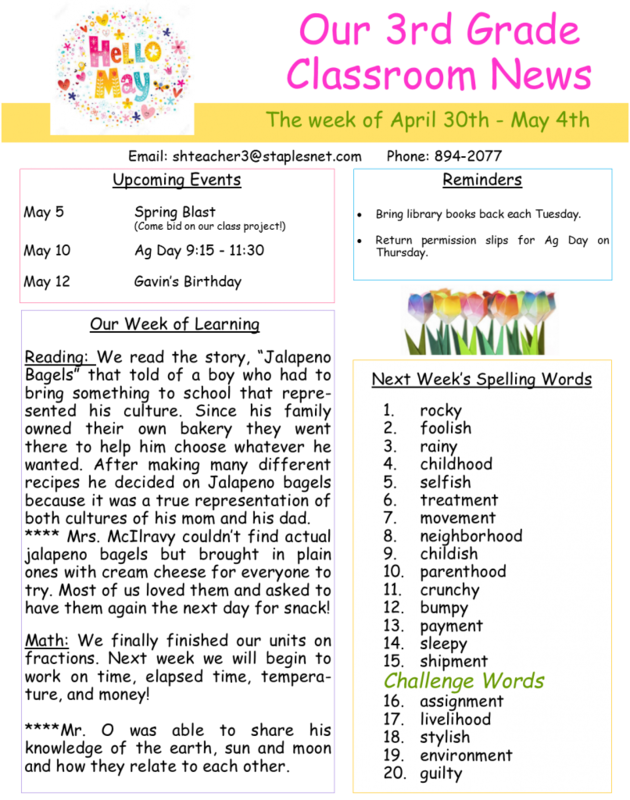 Last week we reviewed possessive nouns. The confusing part is that all of them start with a “p”. 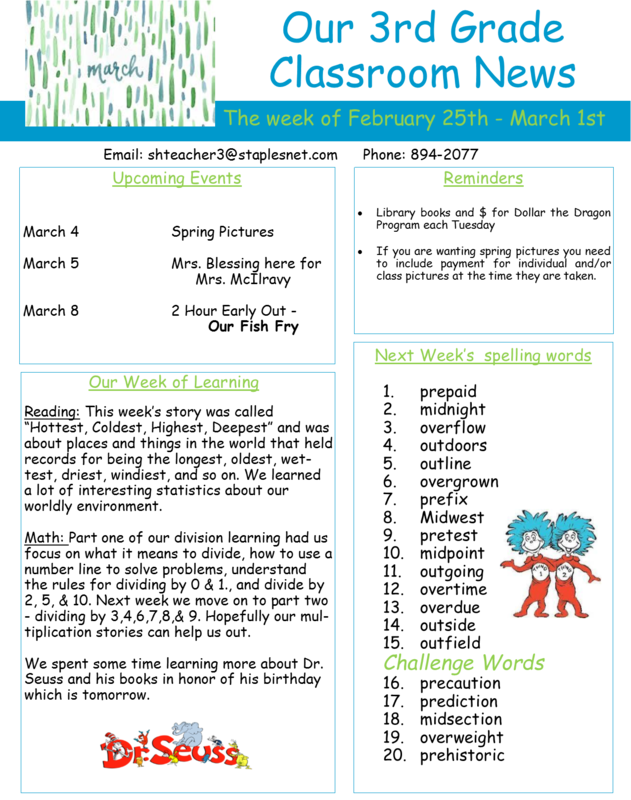 Even though we discussed the difference between each one and gave examples – I now have work turned in with an apostrophe (s) added to each word whether it shows possession or not. I can’t wait until we learn about pronouns!!!!! 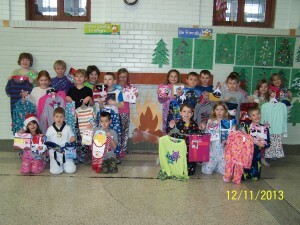 Last week the second and third graders kicked off the “Scholastic Pajama Drive” as one of two service projects we do each year to give back to others. 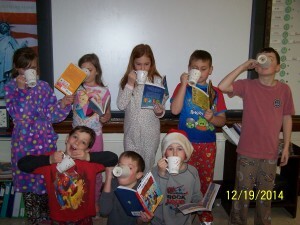 We collect pajamas, send them to Scholastic, and Scholastic sends them out, along with books, to children and adults living in shelters, foster homes, and orphanages. If you would like to help with a donation all you need to do is buy new pajamas in any size and drop them off at the school before December 6th. 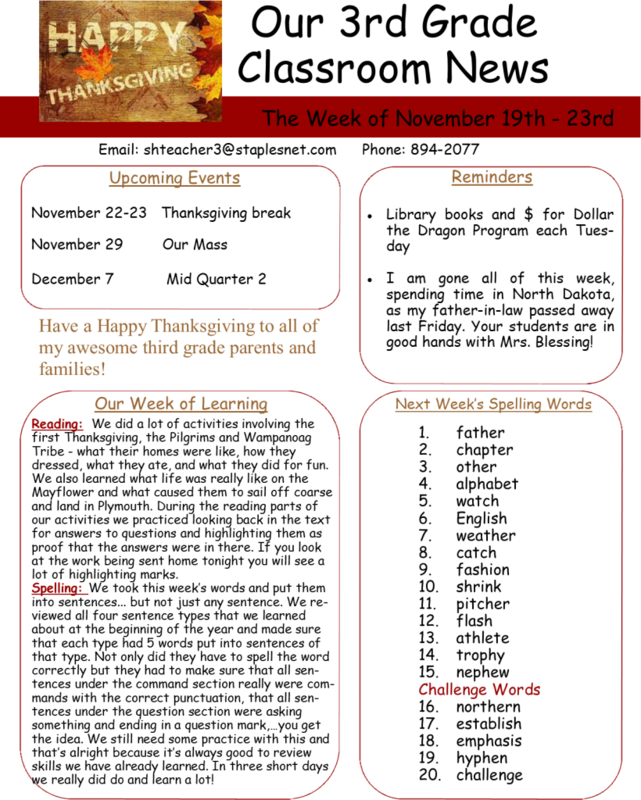 As we get ready for Thanksgiving we will spend this week looking back at why and how it all began with the Pilgrims and Wampanoag Indians. We will also discuss and take a look at all the many things in our own lives that we have to be thankful for. I hope each and every one of you reading this has a blessed Thanksgiving! What are you thankful for? 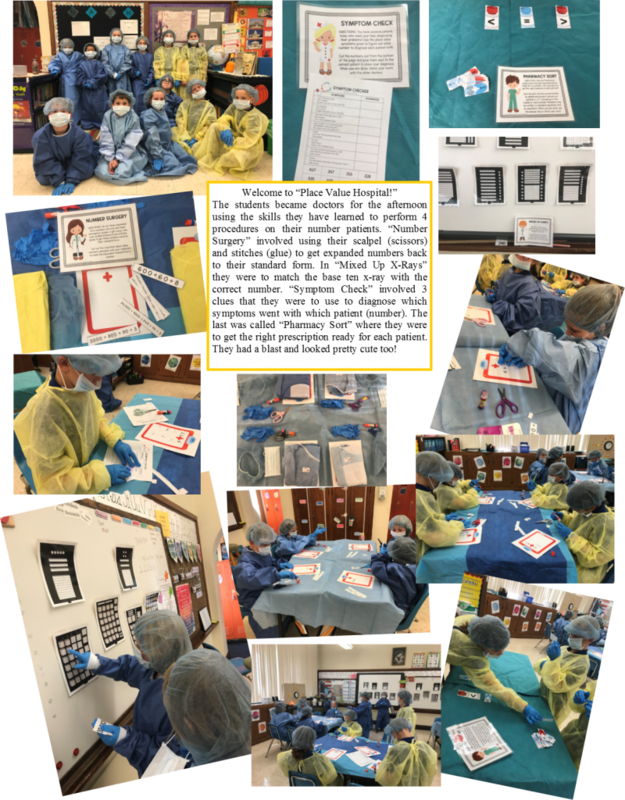 So many exciting things have been happening in our school. First of all, the third graders got to welcome a new student to our room. We are thrilled to have another girl to add to the bunch. We also got to honor our veterans at a special program just for them – our way of saying “thank you” for all that they gave up and did so that we all could live in a free country. 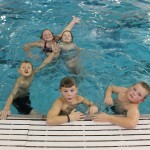 We also made our school goal for the marathon so will get to take part in and enjoy a swim party in two weeks. 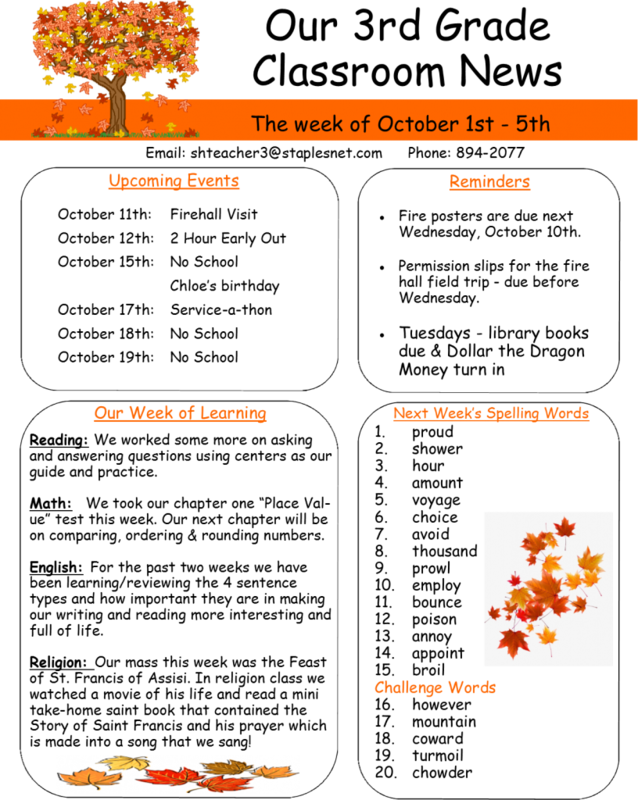 Academically, we continue to tackle regrouping in addition and subtraction, learning the tricks on how to change singular nouns into plural nouns in English, reading stories about problems characters face and how they go about solving them, and in social we are reading “The Leaves in October”. 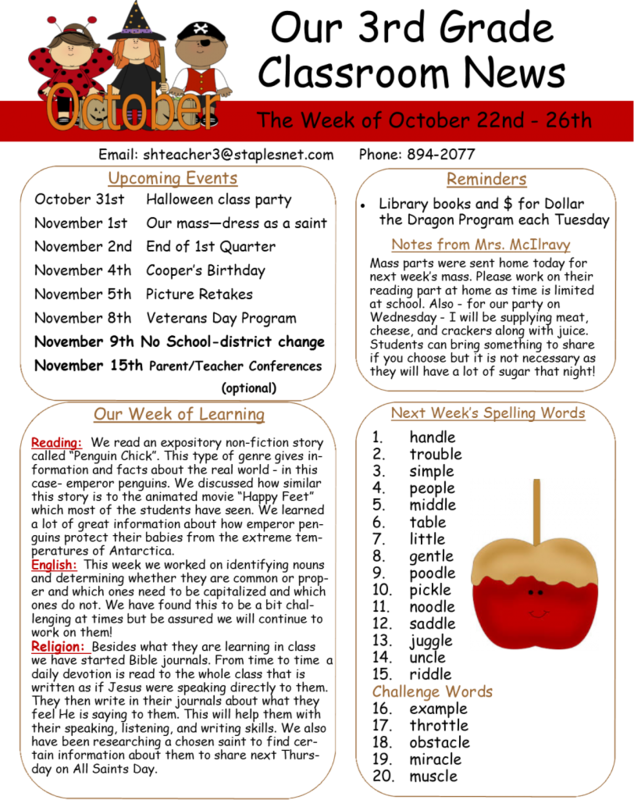 This story will help the students learn about different places to save money and the advantages and disadvantages of each. They will also learn that spending and saving decisions each have opportunity costs – something that must be given up to make it possible to get the other. We hope all are staying warm as the temperatures continue to get lower and lower. 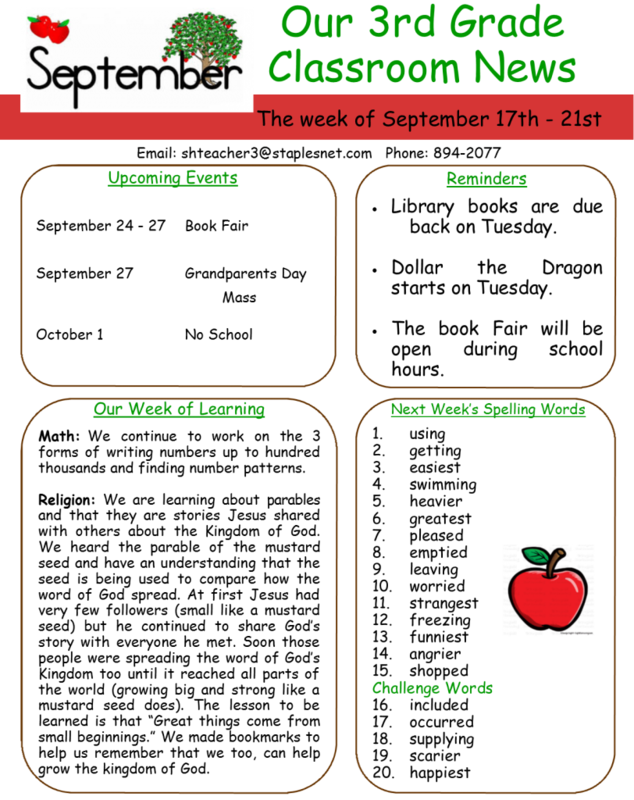 Hard to believe but we are already into our second month of school – where has the time gone? 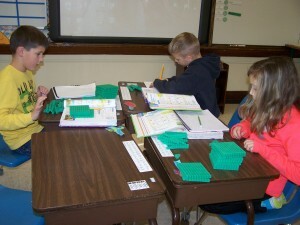 The Third Graders have been very busy working on place value to hundred thousand and rounding to the nearest thousand. We are almost done with our reading unit involving money. We have discussed how to earn it, spend it, and save it. The students are really into these stories as they love money and through our discussions it is easy to tell that they have it down to a science as to how to spend it but find it hard to save it or even want to earn it in the first place. 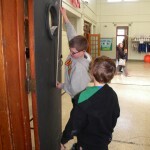 A few weeks ago the Second and Third Graders took a field trip to the local city hall and police department. As part of our social standards we thought it would be more meaningful to actually see some people in charge of our community and what their responsibilities were involving the city. 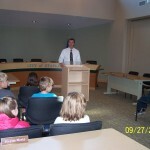 We visited with Nate Mathews who is the city administrator. 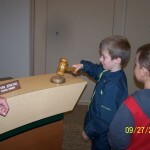 He gave us a tour of the city hall and took us into the city council room where most of the action happens. He explained to us what the room was for, who the council members were, what their jobs required and some of the topics they need to discuss to take care of the city. The students came away with knowing that the city is governed by the mayor and city council members. Since then we have talked about how each state has a government that is led by the governor and that our national government is made up of three branches – all having specific leaders and jobs in making important decisions for the United States. We are off to a busy, hardworking start! Happy Fall! 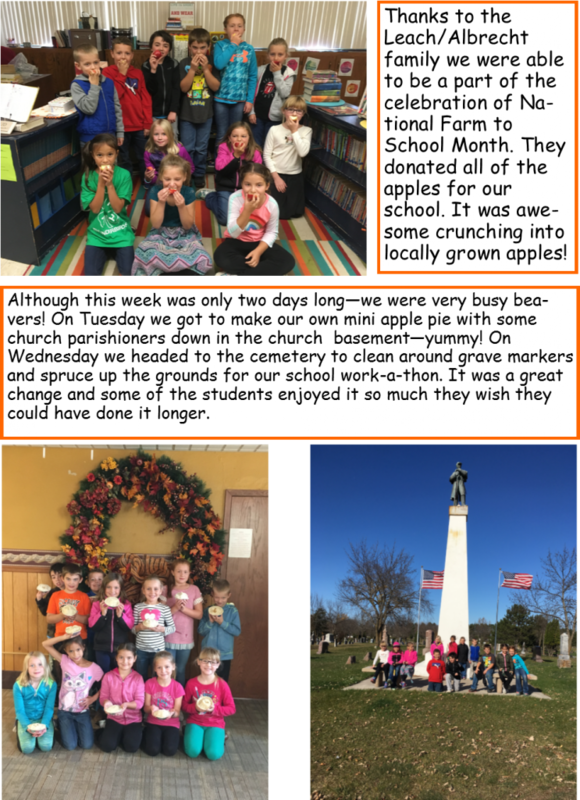 Click here to read more about our field trip. Ready for our city hall tour! Mr. Mathews sharing information about our community government. Welcome to the 2013-2014 school year. 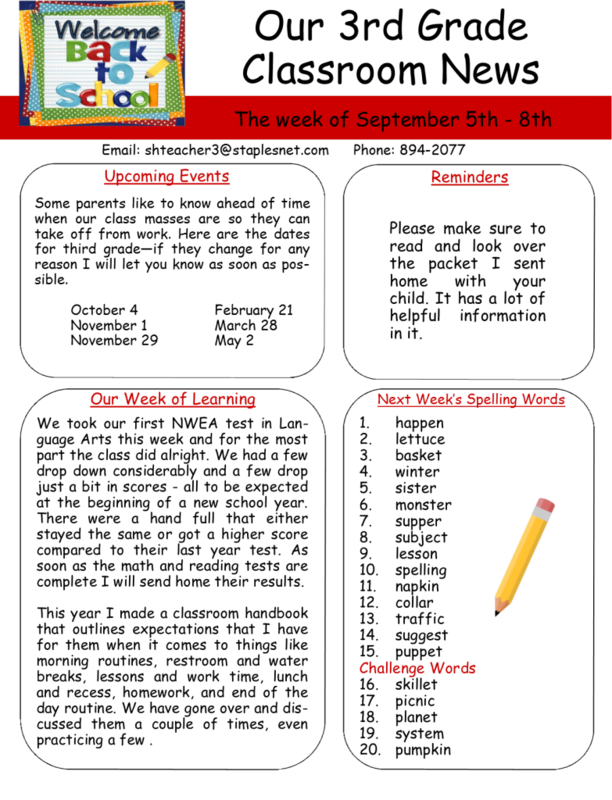 Can you believe that we have already seen our first month of school almost come to a close? In this short time the third graders have settled in to their new routines and have accomplished so much. We have taken the NWEA tests for the fall, celebrated our grandparents with a mass in their honor, and will go on our first field trip to the city hall and police station to learn more about our community government and how it works. I couldn’t start the new year out with my students without introducing them to the newest member of my family. Her name is Miah and she is a 4 month old yellow lab that my family and I adopted this summer. 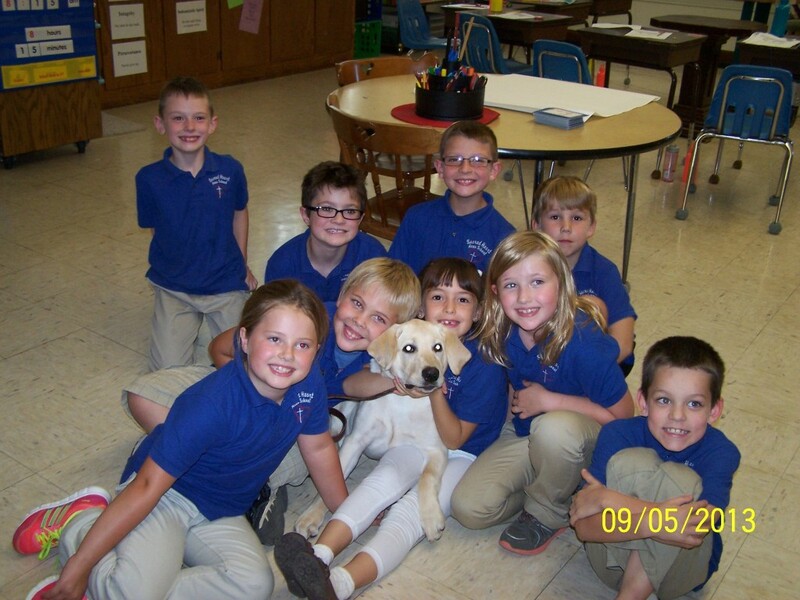 The students loved her as much as she loved getting to know them in the few short minutes she visited. I am looking forward to the adventures we will take this year. The sun is finally shining to welcome summer vacation to begin. I had a great year with my 10 cherubs but the time went too fast. I encourage them to keep up with xtramath, do some exciting reading, and get out and explore their surroundings and use their imaginations to come up with creative things to do. They’ll be that much more ahead and ready for next year. Have a great summer to you all! See you in September! Happy sunny days everyone! It is hard to believe that there is only one more week of school left for the year. Our reading stories tie in to how we are feeling for the summer and that is “freedom” – what it means to be free! Our first story was about the Statue of Liberty and how it has come to symbolize American freedom. It got us into discussing immigration and what it was like for the immigrants when they came over from their native lands. We also watched a few videos on the construction of and underlying reason for the Statue of Liberty. They were amazed to find out that the statue has not always been green. In math we have been talking about intersecting, parallel, and perpendicular lines, what makes up a polygon and classifying quadrilaterals. They find these much easier than those crazy fractions. We all hope you have a great summer vacation. Thank you parents for all of your support! 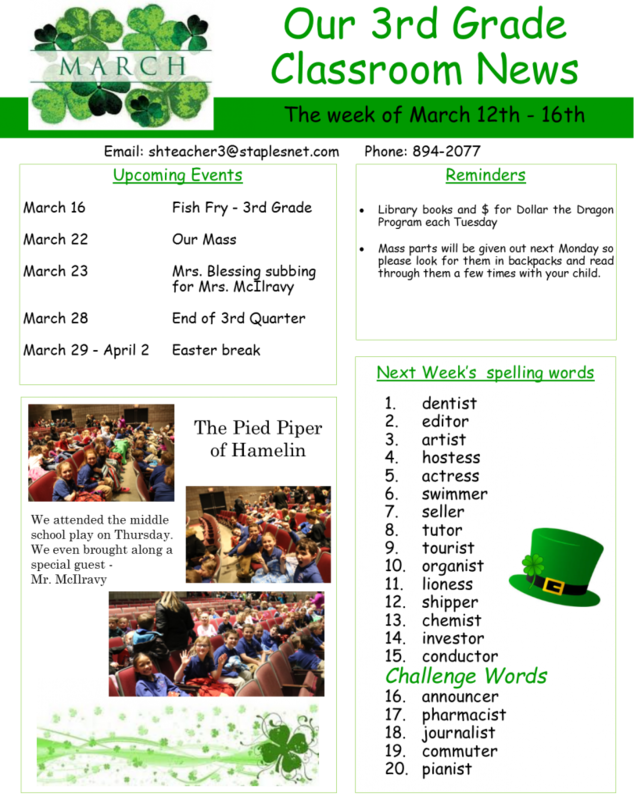 Hello from Third Grade – This week in math we begin our unit on fractions – focusing on what fractions are, how to say them properly, how to write them correctly, and what the words numerator and denominator mean. The students really enjoy talking about fractions because it usually revolves around food and how we can and do split things up among people equally. 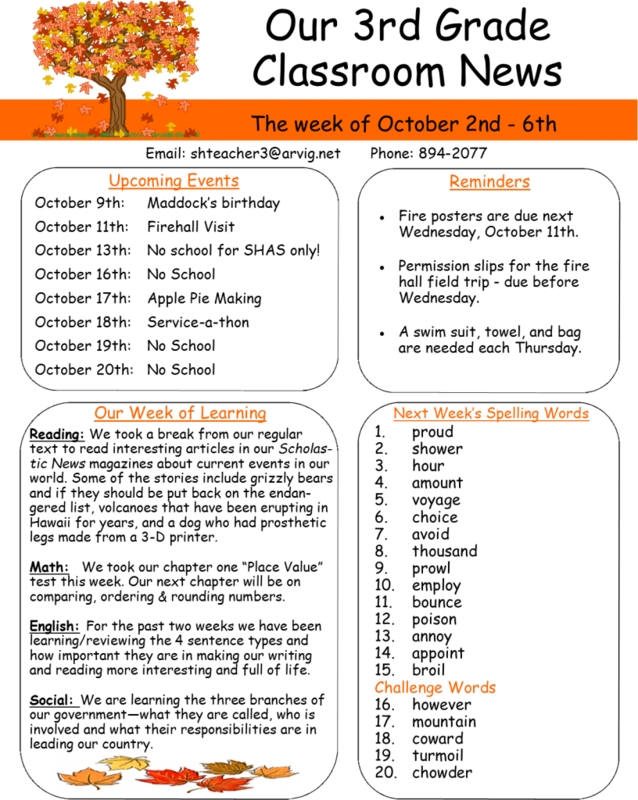 In Reading we are half way through our unit on cultures. These stories are filled with great information regarding several different places around the world – China, Africa, Korea, and Mexico. We were introduced to many different types of foods, clothing, ways of writing, languages, and customs. 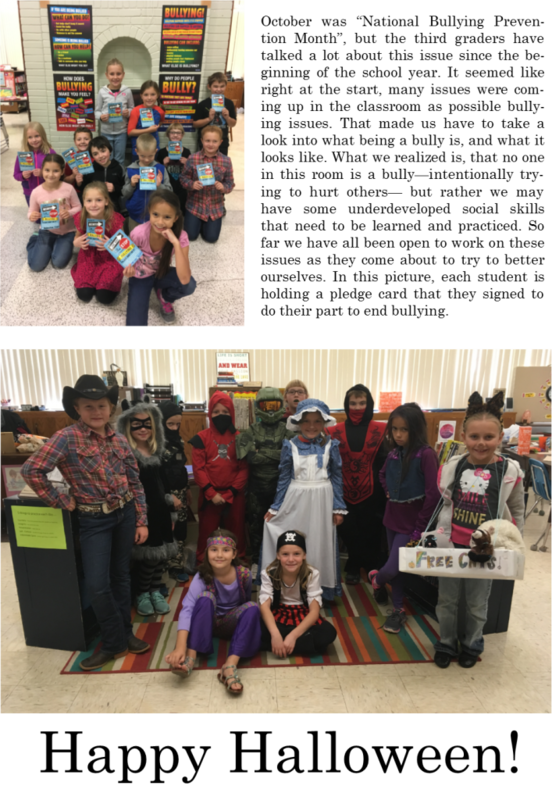 We compared our own lives to those of the children in each story who came from their home land with their families to live in America. They are great stories to show differences among people but also to realize that we are a lot alike in many ways. In social we are discussing the difference between consumers and producers and how we spend our money on wants and needs. What a great day it is – the sun is shining, the snow is melting and we have just completed 3rd quarter. I’m not sure where the time has gone but I hope it slows down a bit for our last quarter – only 2 months – together. We sent a week and a half talking about being unique and how it must feel to be the first to do or accomplish something that no one else has ever done. In reading we heard a short story about Neil Armstrong and how he was the first astronaut to land on the moon but we focused more on stories that were about women in America who were the first at something. These women, (Amelia Earhart, Gertrude Ederle, Eleanor Roosevelt, and Babe Didrikson Zaharias) were all accomplishing their dreams in a time when the role of a woman was seen to be in the home and that they were to remain forever – weaker than men. How times have changed – thank goodness! 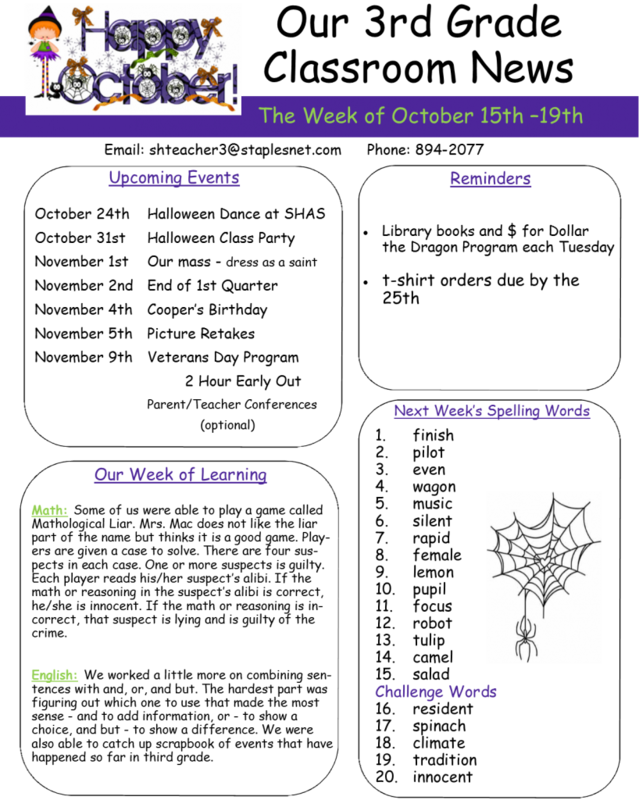 Next week in Social we will be reading The Goat in the Rug which will help us understand that making something (in this case, a rug) requires many resources and why it is not always possible to produce an unlimited amount of something. 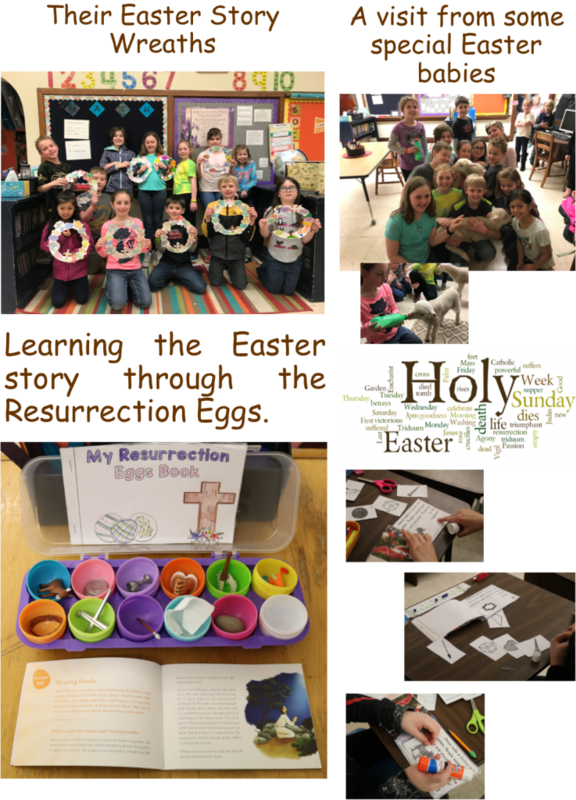 To help us get ready for Easter – the Third Graders went through the Stations of the Cross at church and helped their preschool partners dye Easter eggs. We hope you all have a blessed Easter vacation and remember the real reason for this holy time. Happy Spring, everyone! Can you even imagine it with all of this snow we have? Someday it will all melt away and flowers will bloom – just not as soon as we all had hoped. Well, we finished our map making and they turned out pretty good. We also talked about the different features that act as boundaries on maps such as mountains, rivers, and lakes, and how fences and shrubs can also be considered boundaries in our neighborhoods. Now we move on to learning a bit about the three branches of government. Today we read about Washington D.C. and all the history that is there waiting for them to explore. They were amazed to find out that what they thought was the White House was actually the Supreme Court House. The next few days in Social will all be about what makes each branch special – who is involved and what their roles are in leading our country. In math we are using what we have learned about multiplication to help us with division. They think they don’t know how to divide but when we relate it to a multiplication story learned already they are amazed that they really do know more than they think. I am so excited to see them take on challenges. So much has happened this last month. The students continue to amaze me on their multiplication facts. They have had fun learning stories that help them visualize a picture with numbers as objects or characters so that they can remember facts easier. 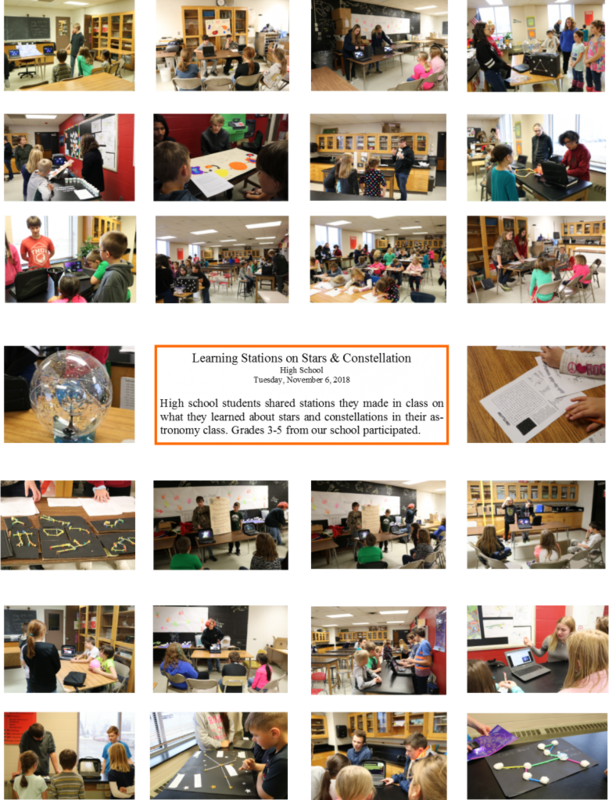 The program I use is “Times Alive” – I love it, the students love it, and it really works. We have replaced our science studies with social studies this quarter. We have been looking at maps, what a map is for, what is needed on a map, how to use one to tell direction, and that there are many different types. Next week the students will take all of their knowledge that they have learned and make their very one map of a made up place. Can you believe – 6 months of school completed and only 3 more months until summer vacation. So much more to learn! 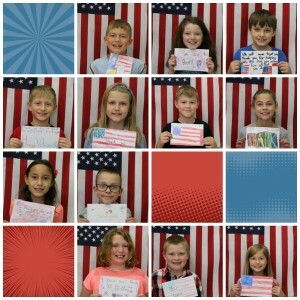 Thank you for visiting the Third Grade News. 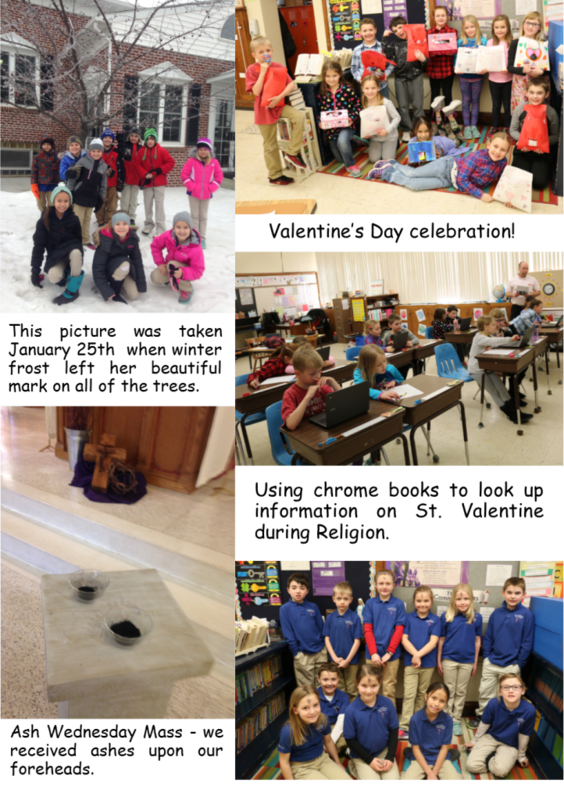 If you are new to our school be sure to check out our ABOUT US page. 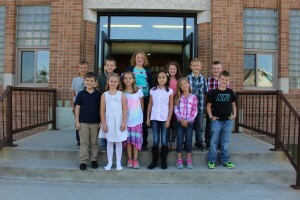 To learn more about our third grade class – go to third grade class tour. Greetings from the Third Grade Classroom! 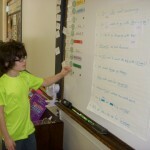 We have been very busy in math with subtraction and trying to remember the steps to take when having to regroup. 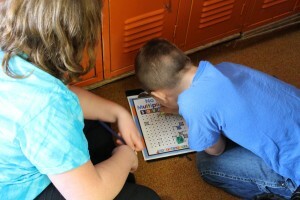 With the help of a computer activity we found called “xtramath” the students have the chance at school or at home each day to master basic addition, subtraction, and multiplication facts. If you have not seen this before for your children, we encourage all of you to look into it – free of charge – and possibly sign up to practice – the students love it so far. 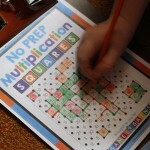 We are now moving into the exciting world of multiplication. The students were amazed when they found out that all along they have known how to multiply if they have ever skip counted. 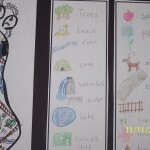 In reading we have been reading stories about people and nature and how they are connected. The stories are written differently each time – some as a regular story but others as a play or several written letters. This makes reading them very interesting and has made the students question why an author would write like this – and that’s a great thing! 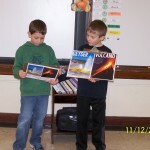 Science has been about learning the relationships between the Sun, Earth, and moon. Many cool activities have taken place and much information has been learned about their size, what each is like, how seasons occur, why the moon changes shape, and what causes shadows. We hope you all have a great weekend. Have a ton of fun at the carnival and eat lots at the dinner!